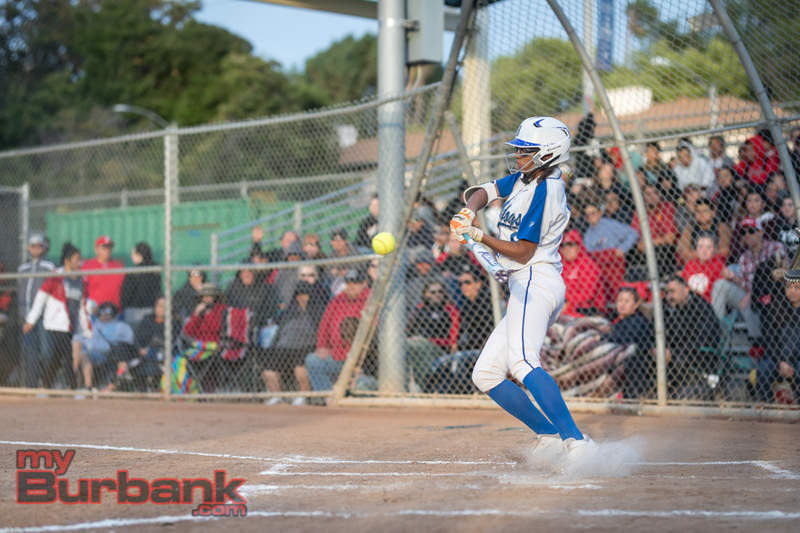 Because of the talent available, it would seem that if the Burbank High and Burroughs softball teams don’t qualify for the CIF Southern Section playoffs, its respective seasons will not be considered very successful. 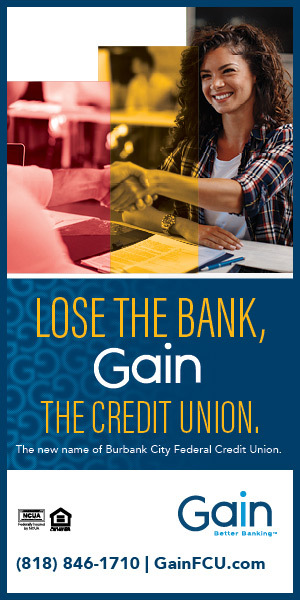 Burbank is coming off a campaign in which it went 16-12 overall and 10-4 for third place in the Pacific League. The Bulldogs played in a Division IV wild-card match against Norwalk and fell 4-2. 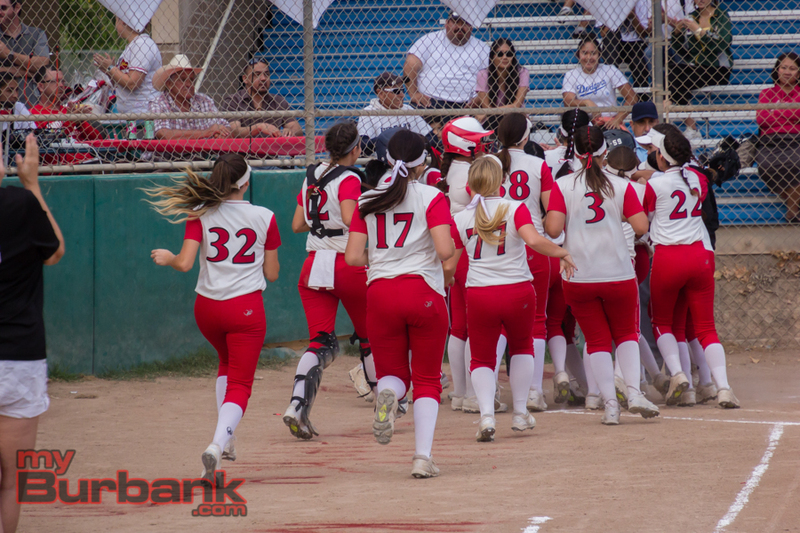 Burroughs went 14-5-1 and 12-2 for second in league and after defeating Bonita 2-0 in a Division III opening-round game, lost to Redlands 4-0 in the second round. Tanigawa is optimistic about this squad. “These girls that we have are a really good core group. They work together. They pick each other up,” he noted. Tanigawa also likes that the team doesn’t rely on one aspect of the game. 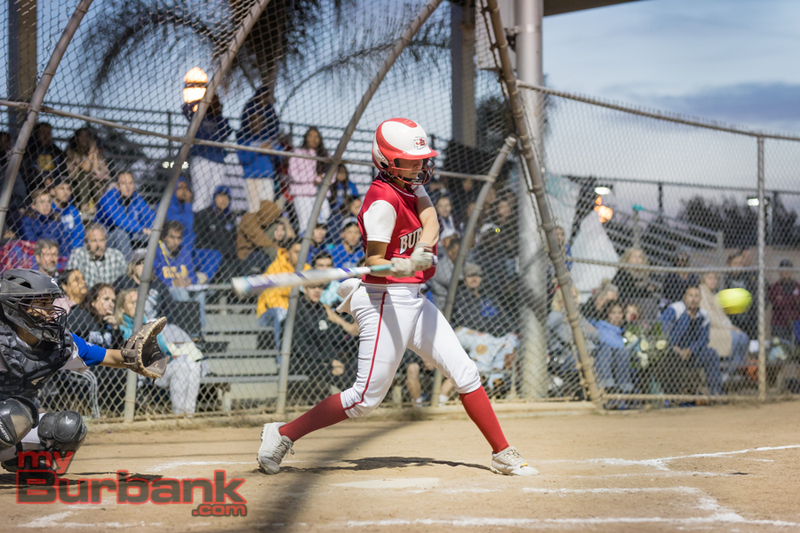 To date, Burroughs lost to Newbury Park 8-0 in the Suzanne Manlet Tournament and collected a 3-2 victory over San Fernando in the same tourney. The Indians begin league play on March 5 when Pasadena makes a visit and will host Burbank on March 29 and travel to the Bulldogs on April 25. Beside Miraglia, other key performers that graduated includes outfielder Hannah Talavera and second baseman Nikki Ricciardella. The most valued commodity is always pitching and the Bulldogs, who lost Allie Benson to graduation, have a good one in senior Alyssa Porras. 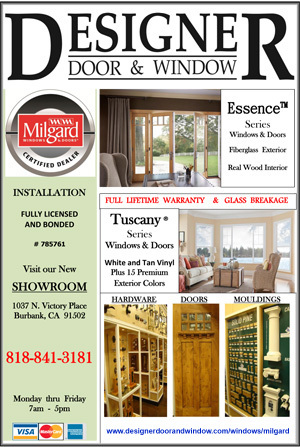 Mike Delaney, the Burbank coach, thinks this should be a productive season. Like Tanigawa, Delaney is also optimistic. 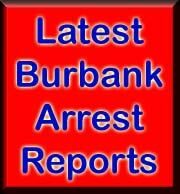 Burbank has lost to Louisville 6-4 in the Hart Tournament and fell to Calabasas 6-4 in the same tourney. 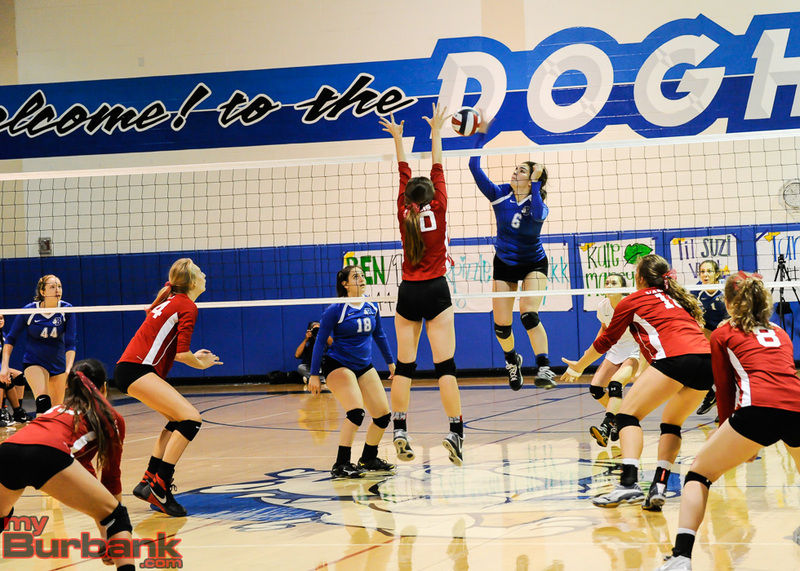 The Bulldogs commence league action on March 5 when they host Glendale. Backing up Porras, who worked many innings in 2018, and will be asked to toe the rubber for 200 innings this season, will be junior Savannah Benson, Allie’s younger sister. A key member will be senior Alex Davis, who will be the primary shortstop. 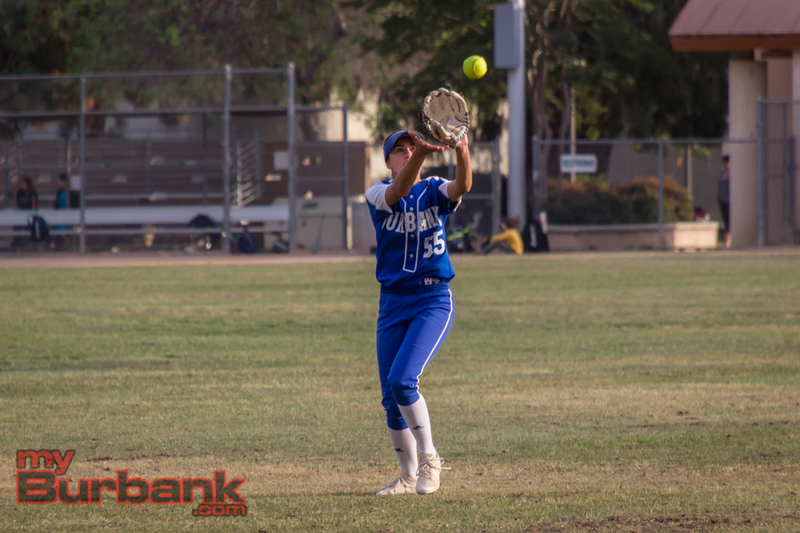 Senior Amaya Broyls, a member of the volleyball team, will see the majority of the time behind the plate for Burbank, which lost to graduation first baseman Erin Lashkari, infielder/outfielder Anysia Gonzalez and outfielder/second baseman Macie Jensen. Senior Nikki Davis and senior Carly Oldfield will battle for first base. Senior Desiree Gomez is the primary third baseman and will relieve Broyls on occasion as the catcher. Sophomore Erika Montoya, who played on the basketball team, will play second base. 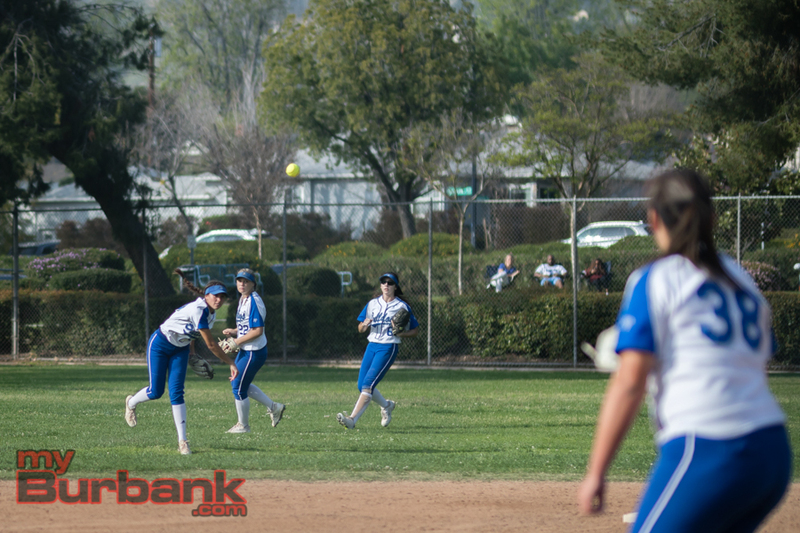 Burbank’s outfield will include senior Sarah Garelick in left field, senior Izzy Sanchez in right field and sophomore Victoria Sanchez in center field. The rest of the team includes senior Emily Monterrey, who also played on the basketball team, will play at first and third base and act as the designated player. Senior Siena Fagiani will be used in a utility role and designated player, while freshman Bella Scozzola will play first base, third base and the outfield. Junior Tiffany Estrada will see time in the outfield and be used as a utility player. Junior Jordyn Rivero will play in the outfield, utility and designated player, and freshman Elizabeth Zamora will play in the outfield, designated player and utility. The Indians have four starting pitchers and they will need to at least come close to what Miraglia, a member of the Long Beach State women’s softball team, accomplished in her stellar career. The two with the most experience in the circle are junior Sidnie Dabaddie and junior Isabella Kam. The other two hurlers are sophomore Dyani Del Castillo, who played on the basketball team and freshman Kelsey Acosta. The catching chore will fall upon the dependable shoulders of senior Megan Williams. 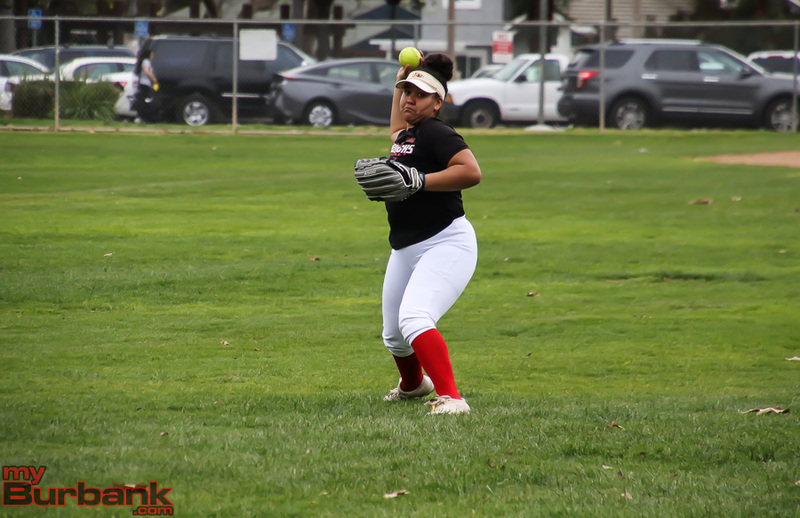 The projected infield for Burroughs will have senior Sierra Harvey at first base, senior Morgan Mersola at second base, sophomore Alyssa Valenzuela at shortstop and junior Memorie Munoz at third base. The Indians’ outfield will consist of senior Hannah Skinner in left field, senior Mia Storer in center field and junior Chloe Bookmyer, the league’s Most Valuable Player Hitter, in right field. The rest of the lineup will have senior Jillian Kukawski, also a member of the basketball team at third base, senior Lauryn Valenzuela at shortstop, senior Citlali Mendez at shortstop, junior Sami Fiorella in the infield and catcher and sophomore Kaitlyn Cisneros in the infield and utility. This entry was posted in Softball, Sports and tagged Alex Davis, Allie Benson, Alyssa Porras, Alyssa Valenzuela, Amaya Broyls, Anysia Gonzalez, Bella Scozzola, Burbank High, Burroughs High, Carly Oldfield, Chloe Bookmyer, Citlali Mendez, Desiree Gomez, Dyani Del Castillo, Elizabeth Zamora, Emily Monterrey, Erika Montoya, Erin Lashkari, Hannah Skinner, Hannah Talavera, Isabella Kam, Izzy Sanchez, Jillian Kukawski, Jordyn Rivero, Kaitlyn Cisneros, Kelsey Acosta, Lauryn Valenzuela, Macie Jensen, Megan Williams, Memorie Munoz, Mia Storer, Morgan Mersola, Nikki Davis, Nikki Ricciardella, Pacific League, Presley Miraglia, Sami Fiorella, Sarah Garelick, Savannah Benson, Sidnie Dabaddie, Siena Fagiani, Sierra Harvey, Softball, Tiffany Estrada, Victoria Sanchez on March 1, 2019 by Rick Assad. 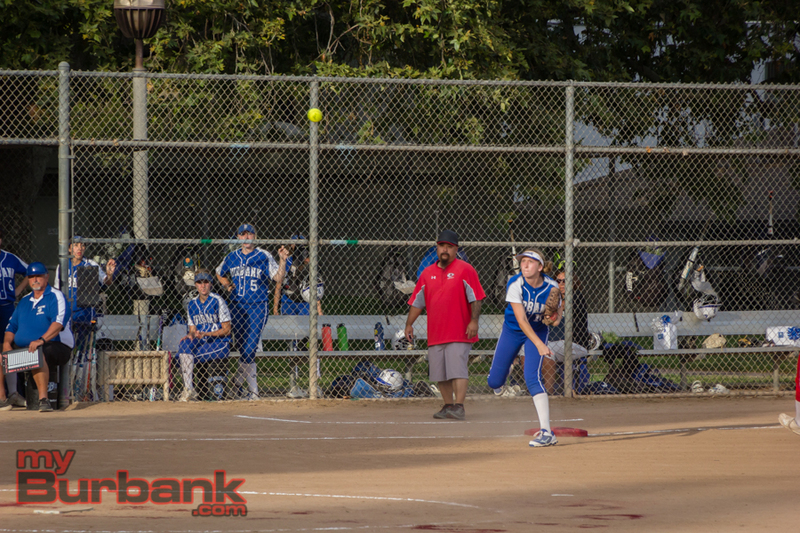 Facing probably the best pitcher this season, the Burbank High softball team would have to be picture perfect. Daunting as this challenge was, there wasn’t a lack of confidence, but this only goes so far. 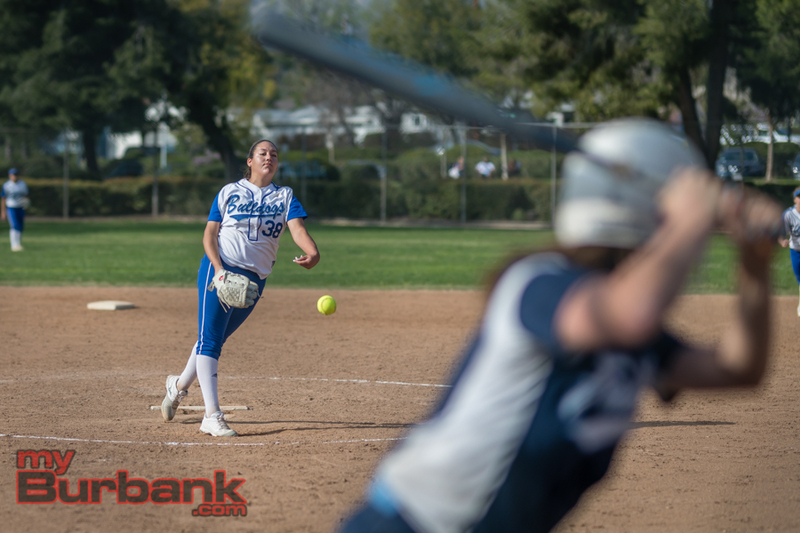 On Tuesday afternoon, the Bulldogs were put in a stranglehold by Norwalk senior hurler Breanna Vasquez, who held Burbank to three hits, striking out a season-best 16 batters with one walk and one hit batter over seven innings en route to a 4-2 win at McCambridge Park in a CIF Southern Section Division IV wild-card game. The Lancers (11-10) did all their scoring in the first inning off junior Alyssa Porras, who gave up an infield single to Vasquez, the leadoff hitter. 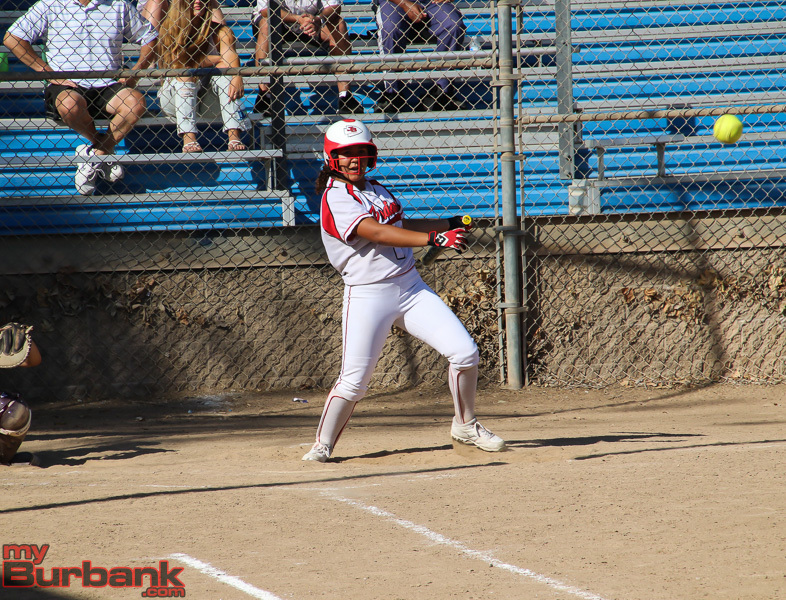 When sophomore Brianna Nunez (two hits) clubbed a run-scoring double down the left-field line, Vasquez scored. Senior Samantha Campos was hit by a pitch and freshman Estefania Perez was safe on the first of two errors in the frame. Sophomore Angelina Perez hit back to the box and was retired at first base and sophomore Destanie Cervantes (two hits) popped up for the second out. Junior Destiny Ochoa made it to first base on an error, but was out at second base for the third out. The Bulldogs (16-12) shaved the advantage to 4-1 with a run in the fifth inning as junior Sarah Garelick was nicked by an offering from Vasquez with one out. Senior Bene Snyder’s grounder moved Garelick to second base and Garelick later scored on an error. 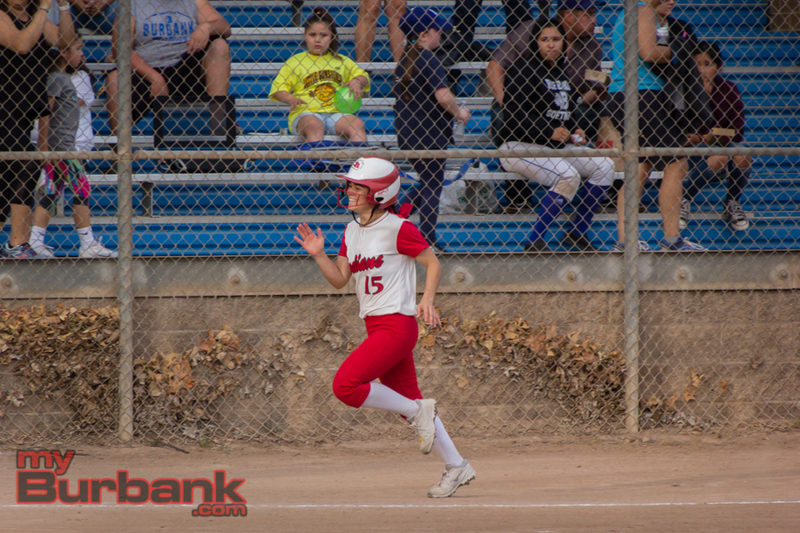 Burbank’s second run came in the seventh when junior Desi Gomez laced a one-out single to right field which prompted junior Carly Oldfield to enter as a pinch runner. After senior Erin Lashkari fanned for the second out, Snyder ripped a base hit up the middle as Oldfield crossed the plate that made it a two-run deficit. Sophomore Katie Treadway then fanned to end the game and the season for the Bulldogs. 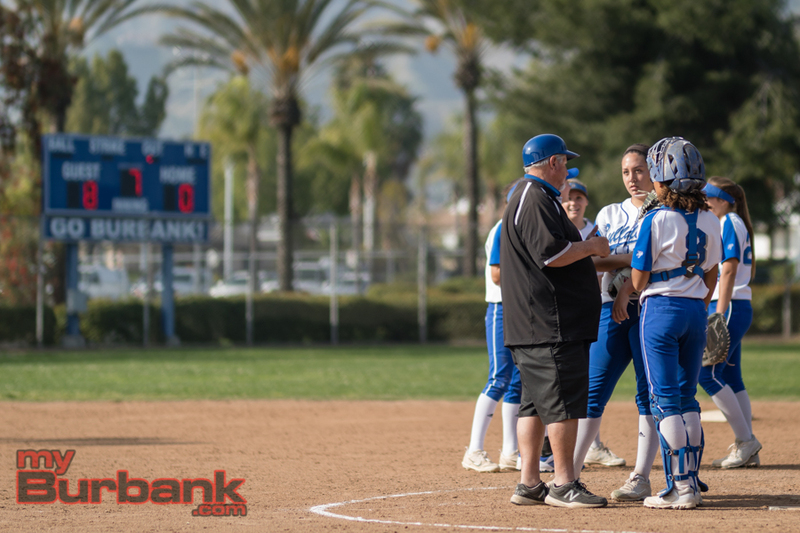 “We just didn’t come out in that first inning, because like I told the team, the first inning is just as important as the seventh inning,” Burbank coach Mike Delaney said. Vasquez was in charge from the outset. “The first couple innings I was feeling really confident. The last couple of innings I was a little nervous, but my team has my back,” said Vasquez, who will play softball at Central Florida. 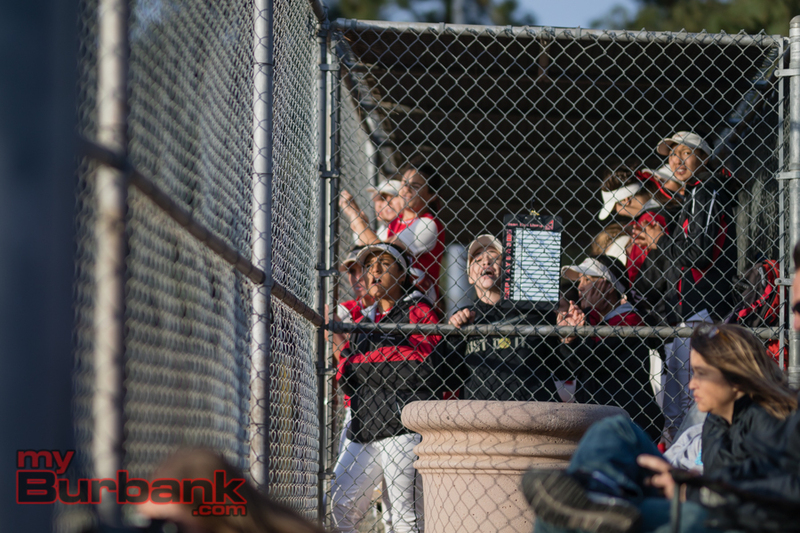 There was tension in the seventh inning because the Bulldogs had runners on first and second base. 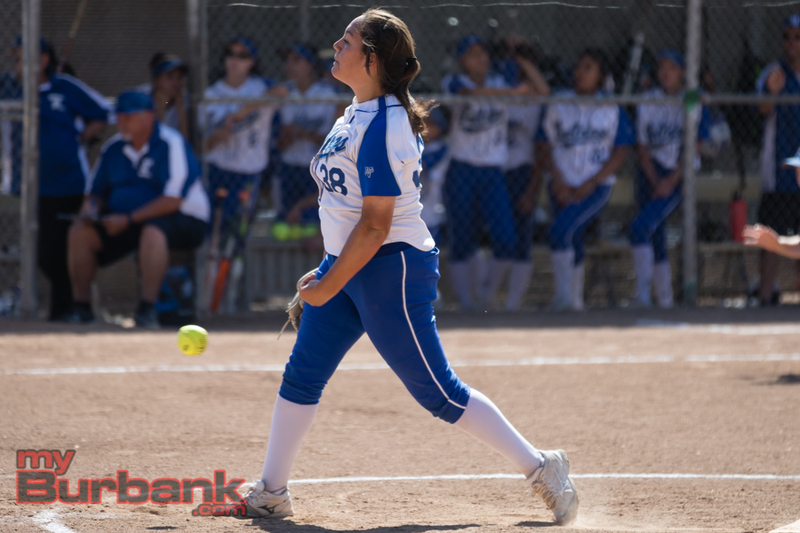 Vasquez came out gunning in the opening stanza as she struck out senior Macie Jensen and junior Amaya Broyls. 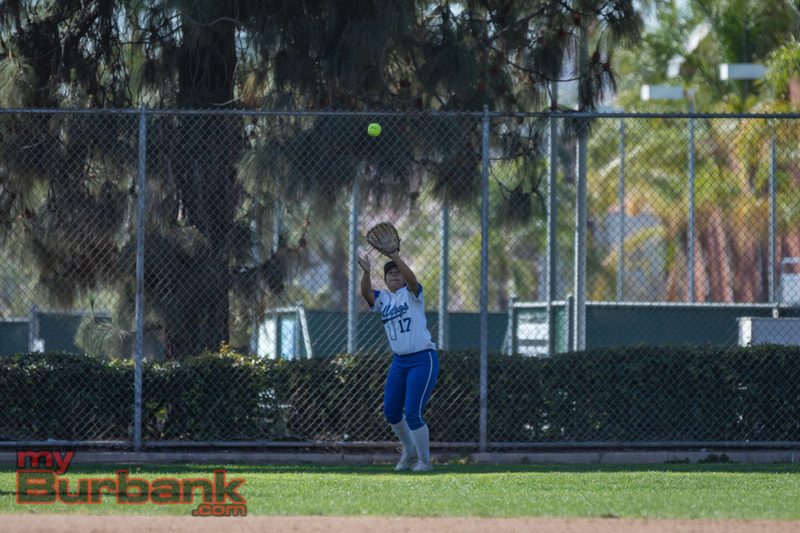 Vasquez then surrendered an opposite field triple to right by junior Alex Davis, but fanned senior Anysia Gonzalez. Vasquez worked a perfect second frame after striking out Gomez and Lashkari and getting Garelick to line out to second base. The third inning was another 1-2-3 affair for Vasquez as Snyder, Treadway and Jensen all fanned. Vasquez struck out the side in the fourth as Broyls was retired catcher to first base, Davis looking and Gomez swinging, but issued her only walk to Gonzalez, the third hitter of the inning. Another perfect inning came in the sixth for Vasquez, who induced Jensen and Broyls to ground out to third base and Davis to fly out to center field. 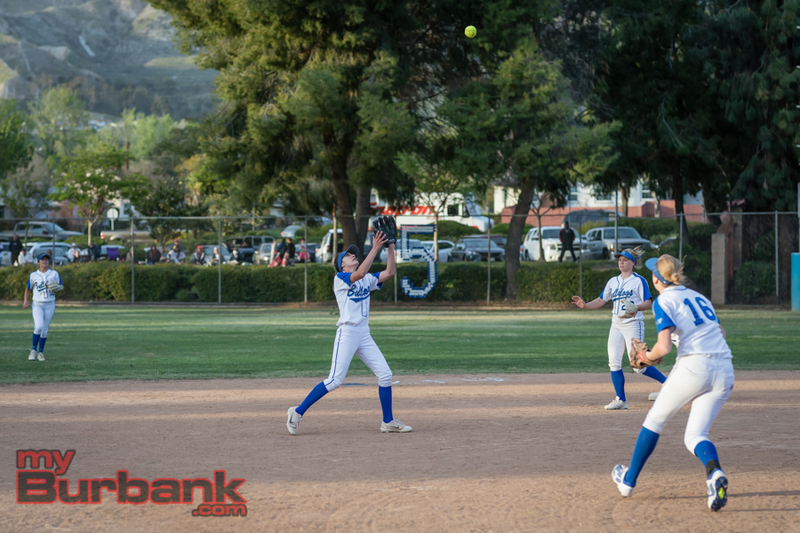 This entry was posted in Softball, Sports and tagged Alex Davis, Alyssa Porras, Amaya Broyls, Anysia Gonzalez, Bene Snyder, Burbank High, Carly Oldfield, CIF wild card, Desi Gomez, Erin Lashkari, Katie Treadway, Macie Jensen, Sarah Garelick, Softball on May 16, 2018 by Rick Assad. 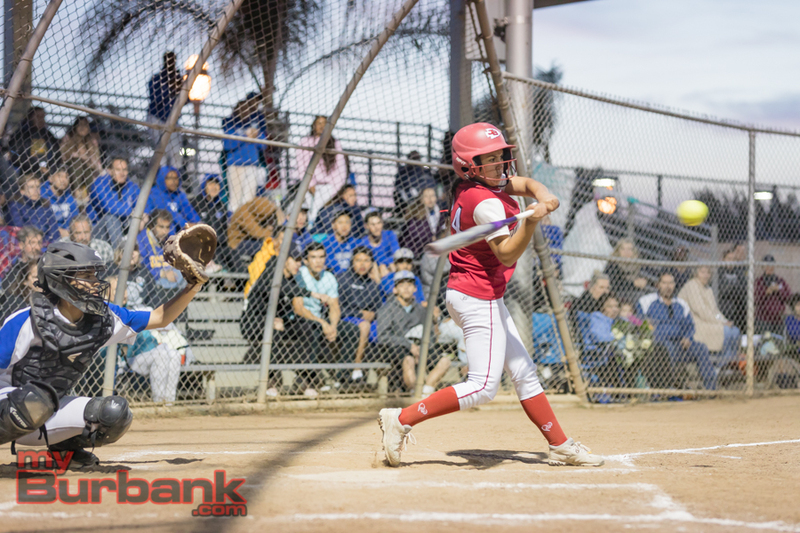 A two-run first inning by the Burroughs High softball team was met with full backing by the home crowd at Olive Park on Thursday night. 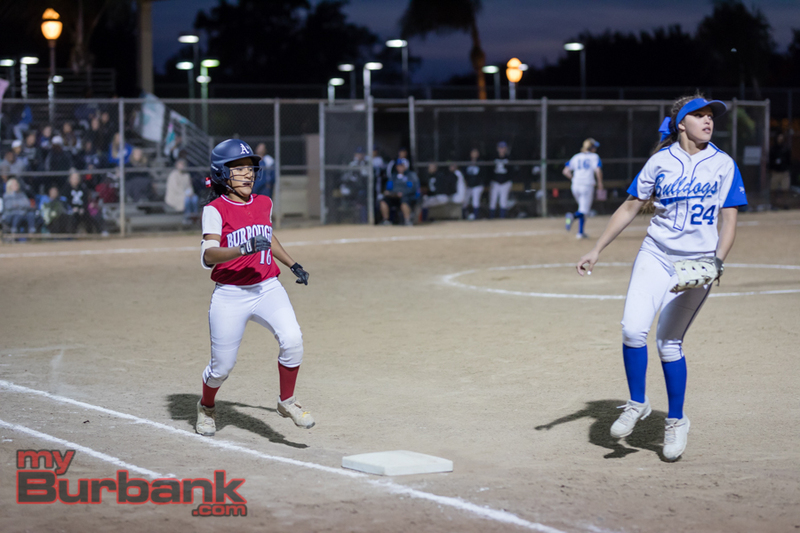 Slowly but surely, Burbank chipped away at the lead, eventually evened it and in the top of the eighth scored the go-ahead and winning run as the Bulldogs earned a 4-3 victory in the Pacific League regular-season finale. Alex Davis led off the frame with a single to right field. Up stepped senior Anysia Gonzalez, who dropped a perfect sacrifice bunt that advanced Davis to second base. But the bunt hit the ground hard and caromed high into the air. Seeing this, the very speedy Davis pulled into third base. Junior Desi Gomez, who singled up the middle with one out in the second, was the next batter and promptly grounded to second base which plated Davis to make it 4-3. In the home half of the inning and facing junior Alyssa Porras, who surrendered 11 hits with a hit batter and two strikeouts across eight frames, senior Nikki Ricciardella popped up to shortstop. Sophomore Memorie Munoz struck out looking, but junior Kaitlin Escamilla was safe on an error. When senior Hannah Talavera fouled out to shortstop behind the third base bag, the game and victory was sealed. 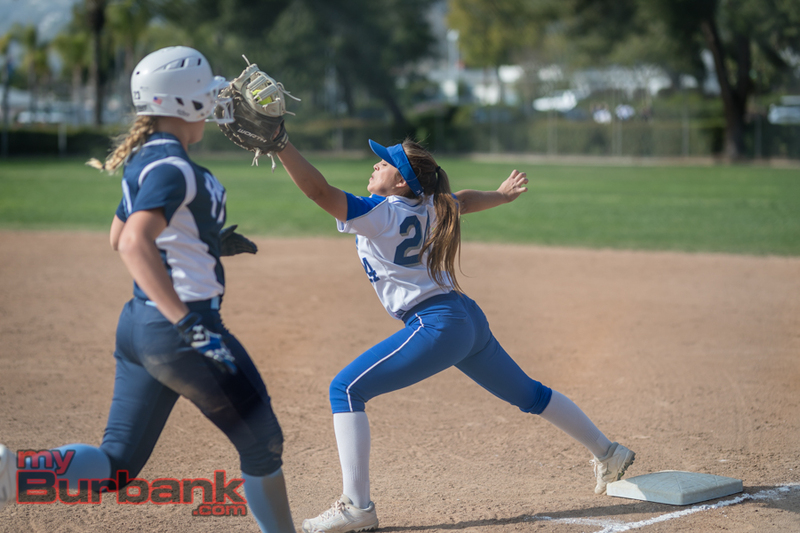 Burroughs threatened to win it in the seventh inning when sophomore Chloe Bookmyer and senior Presley Miraglia each singled with one out. But senior Jessica Amaya and junior Megan Williams each popped up to shortstop. The Indians (13-4-1 and 12-2 for second place in league) sprinted to a 2-0 lead in the opening frame when Escamilla reached on an infield single. Talavera then found a pitch she could handle and lined it down the left-field line and was able to circle the bases and touch home plate. Junior Mia Storer blooped a base hit to left field. Bookmyer (three hits) also reach base on a bloop single to center field. Miraglia lined to center field, Amaya was safe on a force out and Williams popped up to shortstop. Burroughs made it 3-0 with a tally in the fourth as Munoz singled up the middle with one out. Escamilla then bounced back to Porras as Munoz went to second base. A wild pitch saw Munoz advance to third base and when Talavera was safe on an error, Munoz scored. 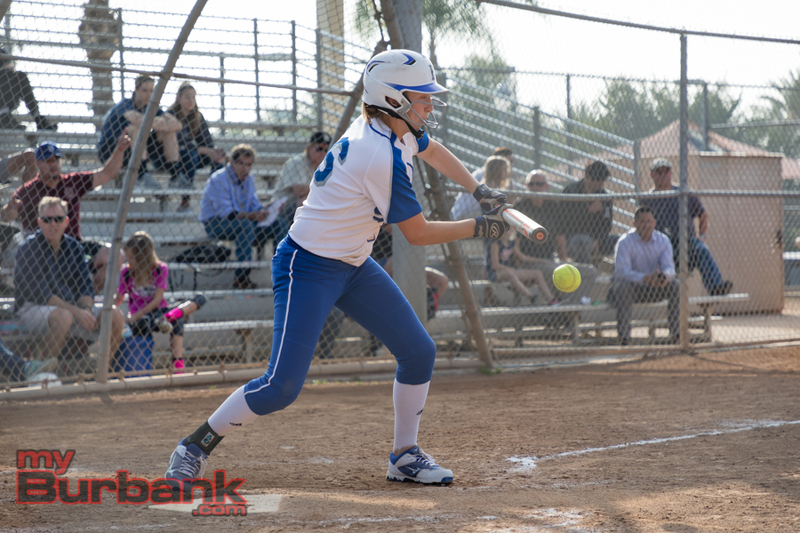 The Bulldogs (16-11 and 10-4 for third place in league) sliced the lead to one run with a two-run fifth as senior Macie Jensen clubbed a two-out, two-run homer that found the right center field gap. Burbank evened it at 3-3 with a run in the sixth as Gonzalez (two hits) bashed a one-out triple to center field. Delaney was extremely pleased with the quick-thinking Davis. Gomez then bunted back to Miraglia, and was safe on a fielder’s choice, but when she flipped the ball a little too high for Williams, the catcher, to handle, Gonzalez found the plate and it was level at 3-3. Miraglia pitched well enough, but was loser after toiling eight innings, allowing six hits with three strikeouts. The Indians could have scored in the second inning, but didn’t as Munoz was hit by a pitch with one out and moved to second base and third base on an error. Munoz remained there as Talavera popped up to shortstop and Storer lined out to center field. In the third, Bookmyer led off with a single to left field and Miraglia (three hits) singled to right field, but Amaya bounced into a double play and Williams lined to third base. In the fifth, Miraglia singled up the middle with one out and junior pinch runner Hannah Skinner went to second base on an error and third base on an infield single by Williams. When Ricciardella hit into a double play, the inning and threat came to a conclusion. Junior Amaya Broyls led off the fourth inning for the Bulldogs with a single, and moved to second base on Gonzalez’s one-out base hit. Neither scored as Davis and Gomez fanned and senior Erin Lashkari flied out to right field. This entry was posted in Softball, Sports and tagged Alex Davis, Alyssa Porras, Amaya Broyls, Anysia Gonzalez, Burbank High, Burroughs High, Chloe Bookmyer, Desi Gomez, Erin Lashkari, Hannah Skinner, Hannah Talavera, Jessica Amaya, Kaitlin Escamilla, Macie Jensen, Megan Williams, Memorie Munoz, Mia Storer, Nikki Ricciardella, Pacific League, Presley Miraglia, Softball on May 11, 2018 by Rick Assad. 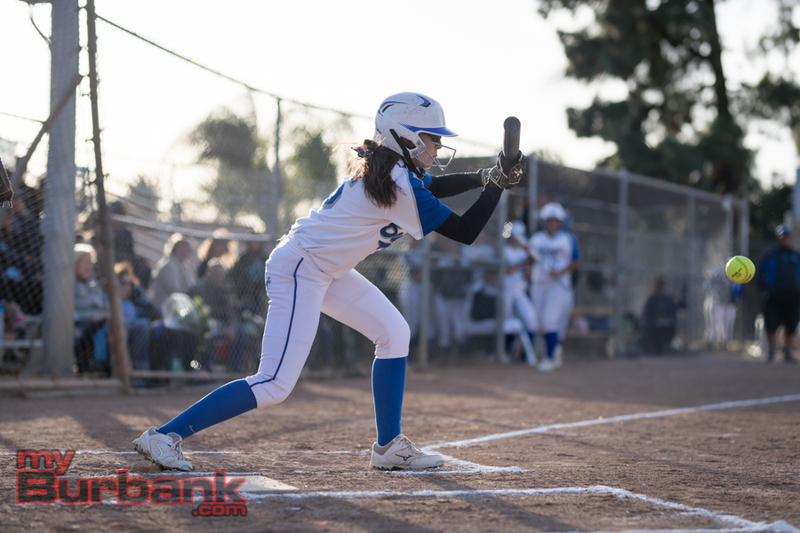 When it comes to hitting, pitching and defense, the Burbank High softball team excelled in one when it met Arcadia on Thursday afternoon at McCambridge Park in a Pacific League match. 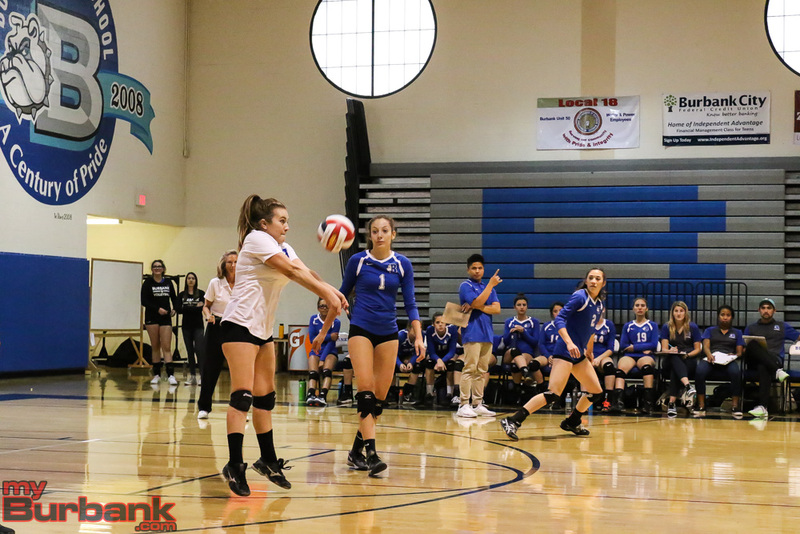 The Apaches were slightly better in three and as a result walked away with a 15-10 decision. The Bulldogs, who were coming off an 11-0 victory over host Glendale two days earlier, managed 13 hits. Leading the charge was junior Desi Gomez, who accounted for three hits that included two triples and a single. Senior Anysia Gonzalez had a triple and a single and sophomore Katie Treadway finished with a triple and a single. Senior Macie Jensen added a double and a single and senior Bene Snyder smashed a double and a single. 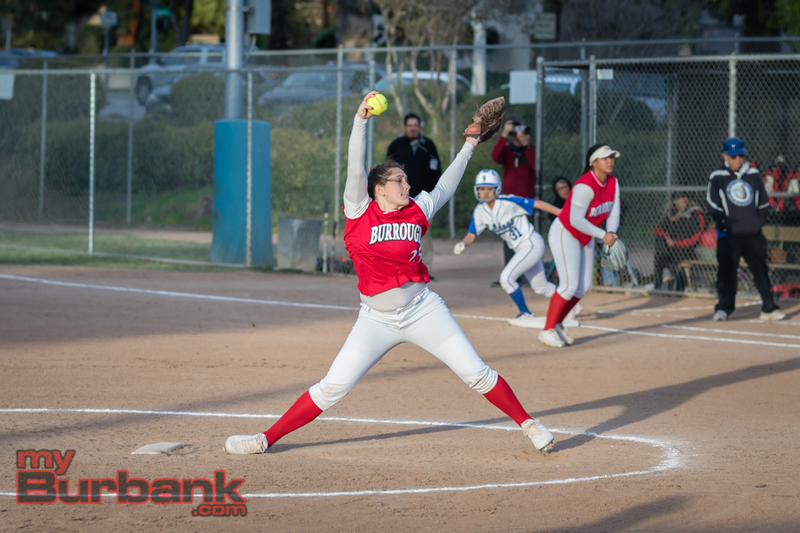 Arcadia (7-8 and 4-4 in league) scored in five of the seven innings and collected 16 hits while Burbank (9-8 and 5-3 in league) also scored runs in five innings. The Apaches scored three runs off senior pitcher Allie Benson in the first as senior Susan Harrison (four hits) belted a one-out, bases-clearing triple to left center. Benson, who toured three innings, yielding six hits, striking out one and hitting one batter, escaped any further damage by getting junior Karly Gillis, who singled in the seventh, to hit into a double play. The Bulldogs cut the edge to 3-1 as Gonzalez tripled in junior Sarah Garelick, who was safe on a fielder’s choice in the first inning. When junior Alex Davis lined a ball delivered by freshman Sophia Garzona over the left field fence for a two-run homer, it was knotted at 3-3. Garzona toiled seven innings, hit a batter and fanned a batter and allowed seven extra-base hits. Arcadia, which banged out 16 hits including four extra-base hits, made it 6-3 in the second inning when junior Megan Lau (three hits) delivered a run-scoring infield single. Freshman Averi Wong (two triples) tossed in a smash back to Benson that scored a run and the other run scored via an error. Burbank shaved Arcadia’s lead to 6-5 with two runs in the second as Gomez’s triple to right center drove in Treadway, who led off with a three-base hit to right center. It became a one-run affair on Jensen’s one-out, base hit to left field that brought home Gomez. 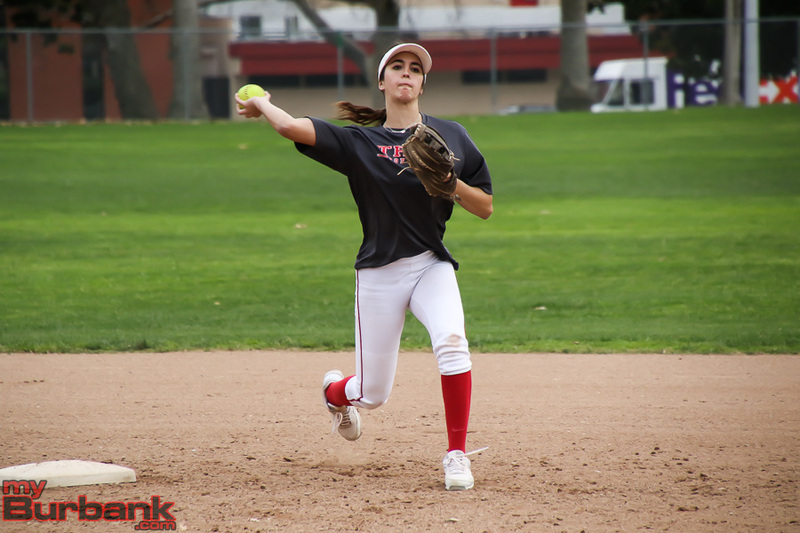 Arcadia’s lead became 9-5 with a three-run fourth off junior Alyssa Porras, who worked four innings, allowing 10 hits with two hit batters, a walk and a strikeout, as Wong clubbed a two-run triple to center field and senior Nicole Puente added a sacrifice fly. With a four-run fifth, Arcadia’s advantage swelled to 13-5 as junior Dejah Westbrook (four hits) knocked in a run with a single. Wong’s triple brought in a pair of runs and Harrison’s single to center field added a run. 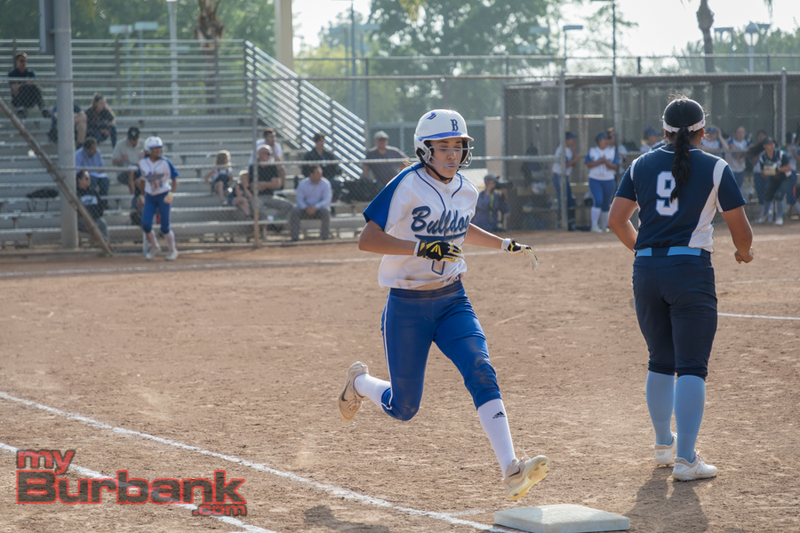 The Bulldogs scored a run in the fifth inning that made it 13-6 as Gonzalez, who singled up the middle with two out, eventually crossed the plate on an error. Arcadia’s final two runs came in the sixth as seven came to bat with only Lau getting a single. 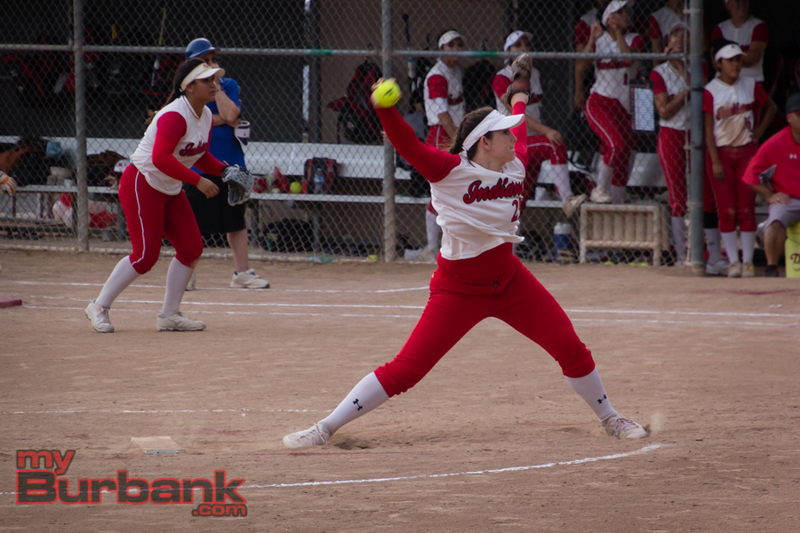 The inning was prolonged by two Burbank errors as the Bulldogs finished with four miscues compared to three for the Apaches. 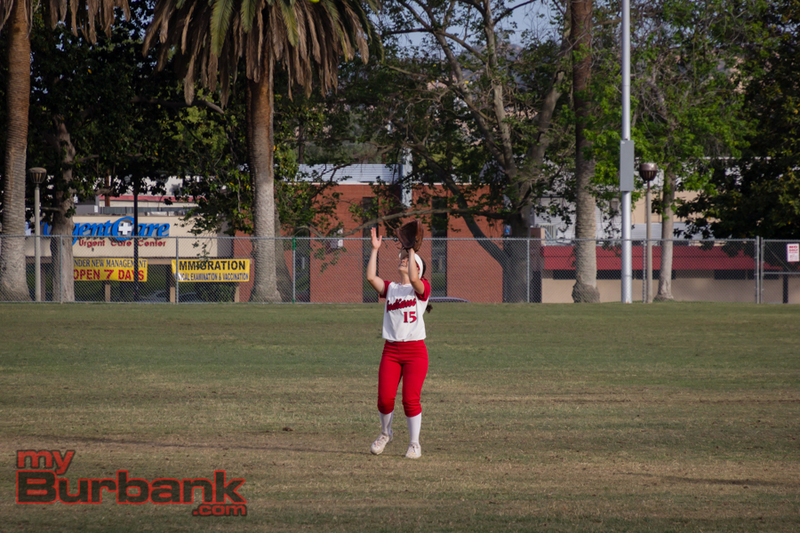 Burbank shaved the lead to 15-7 with a tally in the sixth inning as Jensen’s double to left field scored a run. Burbank tacked on three runs in the seventh inning as Gomez tripled to right center for two runs and Gomez came around on an error. Senior Erin Lashkari also had a base hit for the Bulldogs that came with two out in the seventh inning. 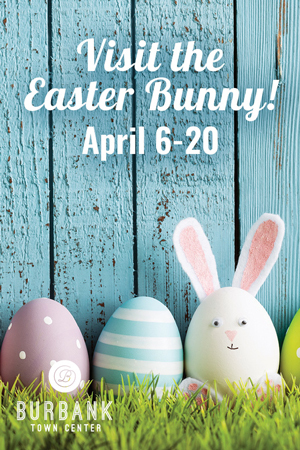 This entry was posted in Softball, Sports and tagged Alex Davis, Allie Benson, Alyssa Porras, Anysia Gonzalez, Bene Snyder, Burbank High, Desi Gomez, Erin Lashkari, Katie Treadway, Macie Jensen, Pacific League, Sarah Garelick, Softball on April 20, 2018 by Rick Assad. 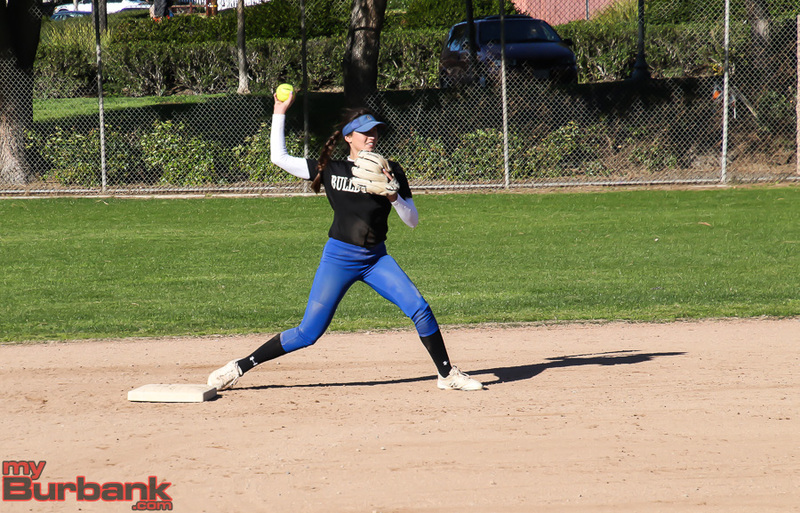 A genuine duel broke out as senior Presley Miraglia and junior Alyssa Porras matched skills in the pitcher’s circle in a Pacific League match on Thursday. 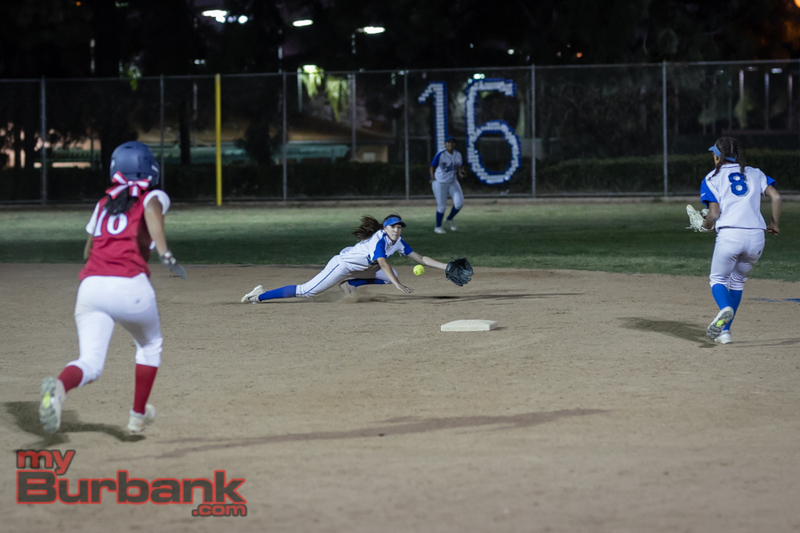 Inning after inning, neither allowed a run until the fourth when an unearned tally crossed the plate, but that was enough for Miraglia as Burroughs High edged Burbank 1-0 on a windy night at McCambridge Park. 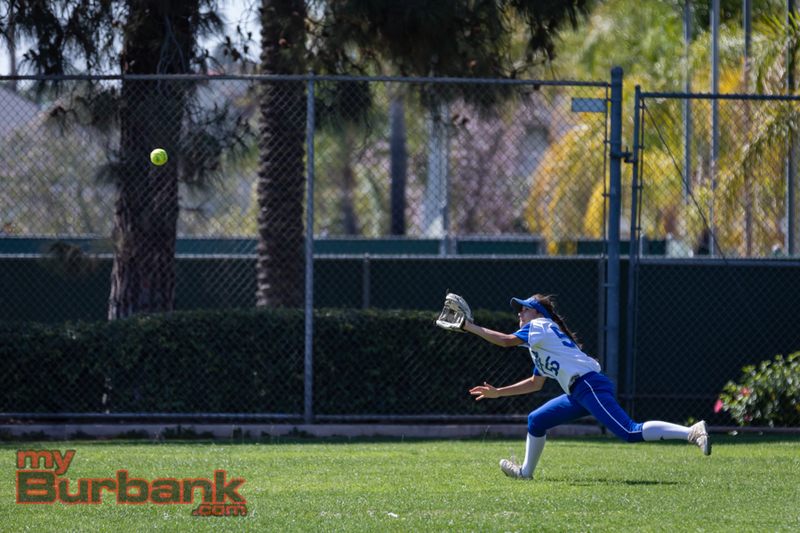 That fateful frame began when Porras retired senior Hannah Talavera on a fly to left field. Junior Mia Storer singled to center field and sophomore Chloe Bookmyer flied to left. Miraglia, who was making her second start of the season after getting her grade-point average in order, singled up the middle as Storer took second base. Senior Jessica Amaya reached on an error as Storer took third and scored to make it 1-0. Porras then induced junior Megan Williams to fly out to right field that ended the inning. Miraglia was sharp, allowing four hits across seven innings, striking out 13 and issuing no walks. “Errors happen. I didn’t think we had a problem fielding,” said Miraglia of the bottom half of the initial inning. Miraglia was on the money with her pitches and felt confident. Porras also went seven frames, fanning three and yielding seven hits with no walks. Miraglia retired the side 1-2-3 in the third, fourth and sixth innings and struck out 10 after five frames. The game began with Talavera reaching base on a wind-assisted infield single as the popup wasn’t fielded. Storer then lined out to right field and Bookmyer bounced into an inning-ending double play. 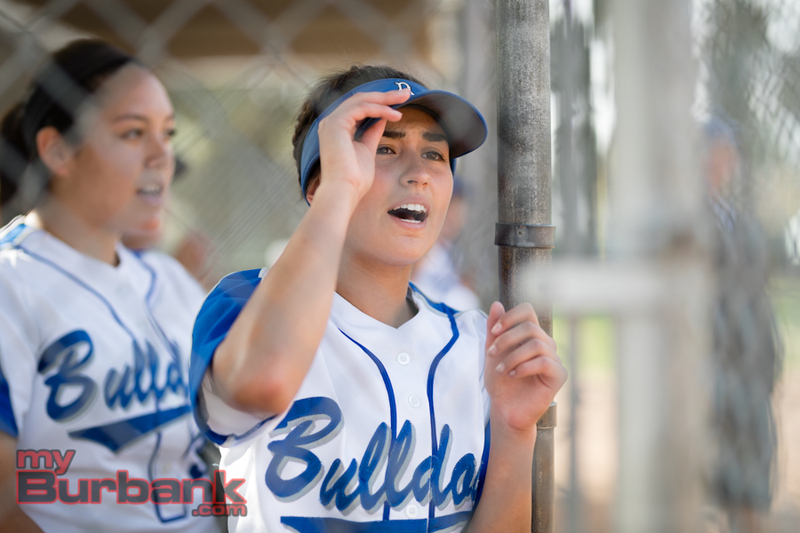 The Bulldogs (8-7 and 4-2 in league) sent five to the plate in the first as junior Amaya Broyls singled to left field with one out. Junior Sarah Garelick laid down a sacrifice bunt as Broyls went to second and then third base after senior Anysia Gonzalez was safe on an error. Miraglia, who has shown no rust after missing the early portion of the schedule, has 21 strikeouts in 14 innings, struck out senior Macie Jensen to end the threat. Porras set down the Indians (6-3-1 and 5-1 in league) in order in the second as Miraglia grounded out and Amaya fanned looking while Williams grounded out. Miraglia struck out senior Erin Lashkari and senior Bene Snyder to begin the second inning. Junior Desi Gomez then reached an a wind-helped infield pop, but the frame concluded when sophomore Katie Treadway struck out swinging. 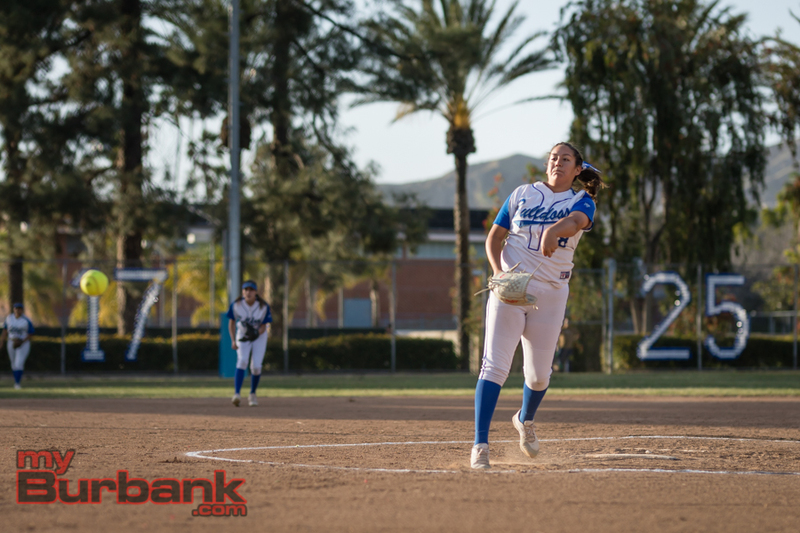 Porras was brilliant in the third as senior Nikki Riccardella popped up, junior Citlali Mendez grounded out and sophomore Memorie Munoz struck out. Miraglia answered as she set down the Bulldogs in order, fanning junior Alex Davis, then getting Broyls and Garelick on infield popups. It was more of the same in the fourth for Burbank as Gonzalez fanned, while Jensen flied out to right field and Lashkari popped up. The Indians went down 1-2-3 in the fifth as Riccardella popped up, Mendez flied out to center field and Munoz grounded out. The bottom of the fifth inning saw Miraglia strike out the side as Snyder went down looking, Gomez swinging and Davis swinging. Treadway, the third batter in the frame, singled to left center and stole second base. Six batters trotted to the plate in the sixth for the Indians with Talavera getting a leadoff single to right center. Storer was safe on an error and Bookmyer singled up the middle. Porras retired Miraglia on a liner back to the box, Amaya reached on a force out and Williams lined out to left field. The Bulldogs did nothing against Miraglia in the sixth as Broyls grounded out, Garelick lined out to right field and Gonzalez struck out swinging. Pinch hitter, junior Kaitlin Escamilla, singled to right field for the Indians in the seventh, but sophomore Isabella Kam, a pinch hitter, struck out. Munoz fouled out to the catcher, Talavera singled up the middle for her third hit, but Storer grounded out. Miraglia faced four hitters in the seventh as Jansen fanned looking, Lashkari then singled to right center. Pinch hitter, senior Allie Benson, struck out swinging and Gomez flied out to right field in foul territory for the final out. This entry was posted in Softball, Sports and tagged Alex Davis, Allie Benson, Alyssa Porras, Amaya Broyls, Anysia Gonzalez, Bene Snyder, Burbank High, Burroughs High, Chloe Bookmyer, Citlali Mendez, Desi Gomez, Erin Lashkari, Hannah Talavera, Isabella Kam, Jessica Amaya, Kaitlin Escamilla, Katie Treadway, Macie Jensen, Megan Williams, Memorie Munoz, Mia Storer, Nikki Riccardella, Pacific League, Presley Miraglia, Sarah Garelick, Softball on April 13, 2018 by Rick Assad. 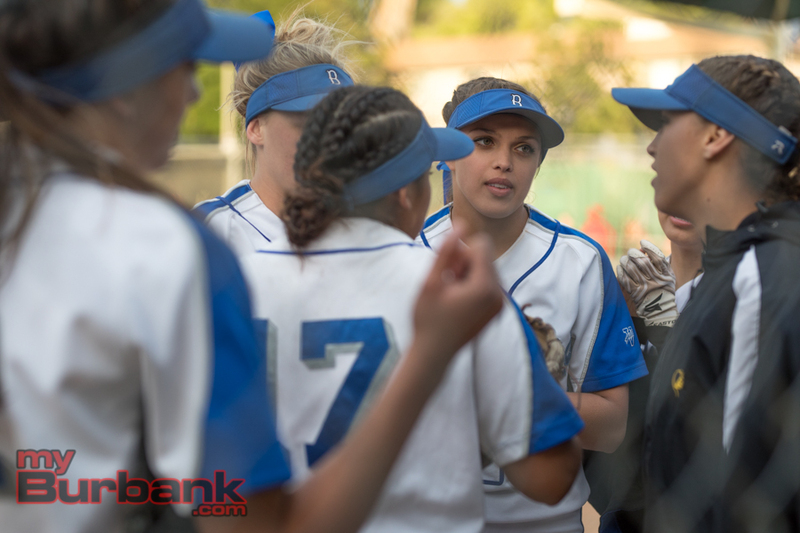 Burbank High softball coach Mike Delaney wants his players to be aggressive at the plate. They weren’t as seven of the nine batters who fanned were called out on strikes as Crescenta Valley powered past the Bulldogs 8-0 on Thursday afternoon at McCambridge Park as the two remaining undefeated teams in the Pacific League met. Delaney said it’s important to know the situation. 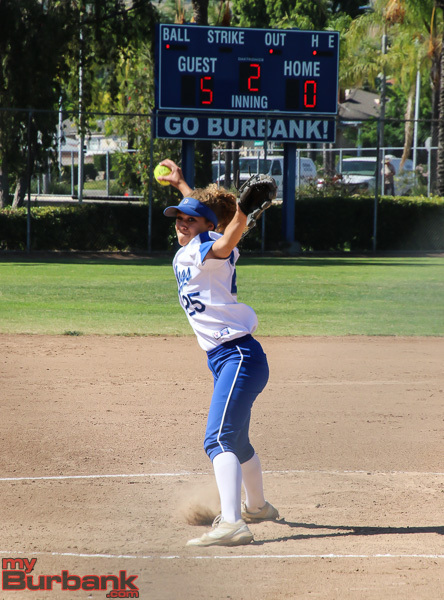 Burbank (6-5 and 3-1 in league) managed just five hits off freshman Dee Dee Hernandez, who delivered seven strong innings. 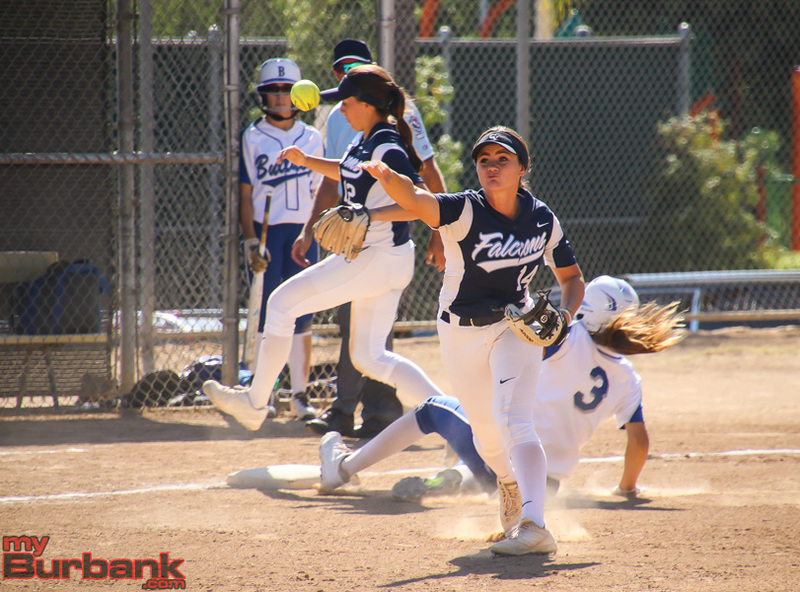 The Falcons (15-1 and 4-0 in league) forged ahead 1-0 in the second inning on a run-scoring single by freshman Devon Medina off senior Allie Benson, who left after three and two-third frames, walking one and allowing eight hits. 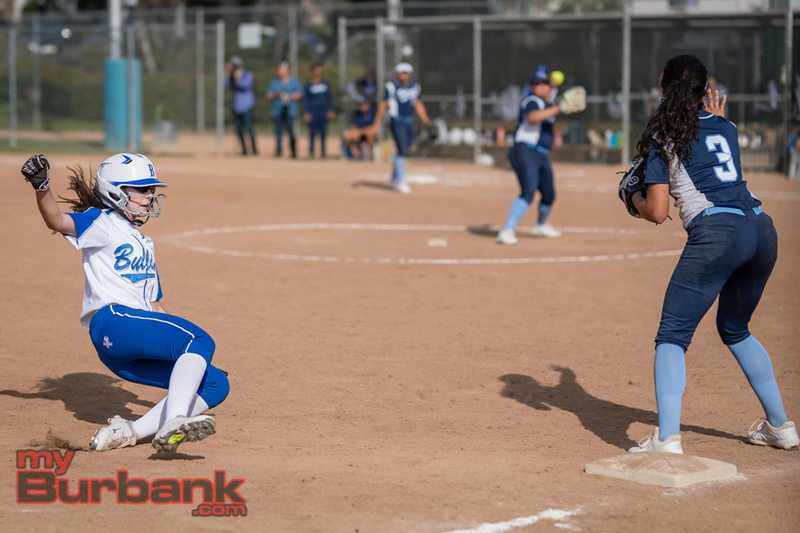 Crescenta Valley added three runs in the fourth inning against Benson as Medina had a run-tallying grounder and junior Alyssa Hernandez a run-scoring triple to left field. It became 8-0 after a four-run seventh as eight batters trotted to the plate off junior Alyssa Porras, who went three and one-third innings, fanning one and yielding four hits including Dee Dee Hernandez’s run-scoring base hit up the middle and sophomore Maddie De Leon’s three-run, inside-the-park homer to right center. 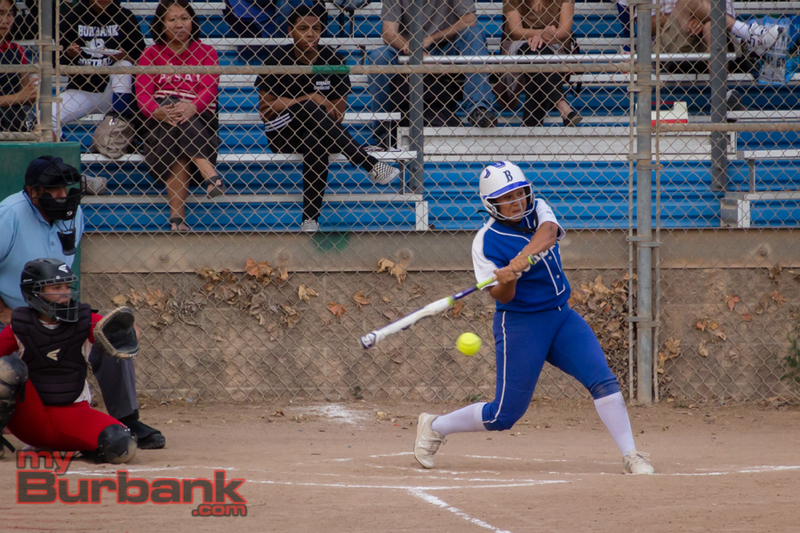 Burbank junior Amaya Broyls led off with a triple to left center in the first inning against Hernandez, who then struck out junior Sarah Garelick looking. Junior Alex Davis lined to right field and Broyls was caught in a run down and was eventually tagged out. Senior Anysia Gonzalez was called out on strikes in the second inning, senior Macie Jensen popped to shortstop, senior Erin Lashkari was hit by a pitch and Hernandez struck out senior Bene Snyder looking. Five batters went to the plate for the Bulldogs in the third frame as junior Desi Gomez and sophomore Katie Treadway both grounded out and Broyls was safe on an error. Garelick singled to center field as Broyls moved to second base, but Davis was caught looking at strike three. Gonzalez opened the fourth inning with a hit to right center and raced to second base on Jensen’s sacrifice bunt. Lashkari flied to center field and Snyder struck out swinging. Hernandez worked a 1-2-3 fifth as Gomez fanned looking, Treadway popped to second base and Broyls fouled to shortstop. Garelick led off the sixth inning with a base hit up the middle and Davis lined to right field. Gonzalez moved Garelick to second base with a sacrifice, but Jensen grounded out to third base. The seventh inning saw Hernandez strike out three batters as Lashkari and Snyder were both caught looking while Broyls struck out swinging. In between, Gomez had a two-out single to right field and scooted to second base when Treadway reached on an error. 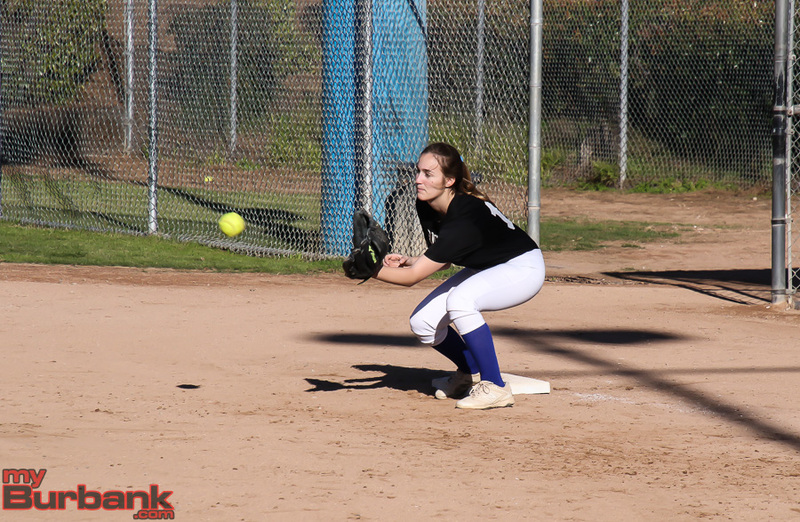 This entry was posted in Softball, Sports and tagged Alex Davis, Allie Benson, Alyssa Porras, Amaya Broyls, Anysia Gonzalez, Bene Snyder, Burbank High, Desi Gomez, Erin Lashkari, Katie Treadway, Macie Jensen, Pacific League, Sarah Garelick, Softball on April 6, 2018 by Rick Assad. 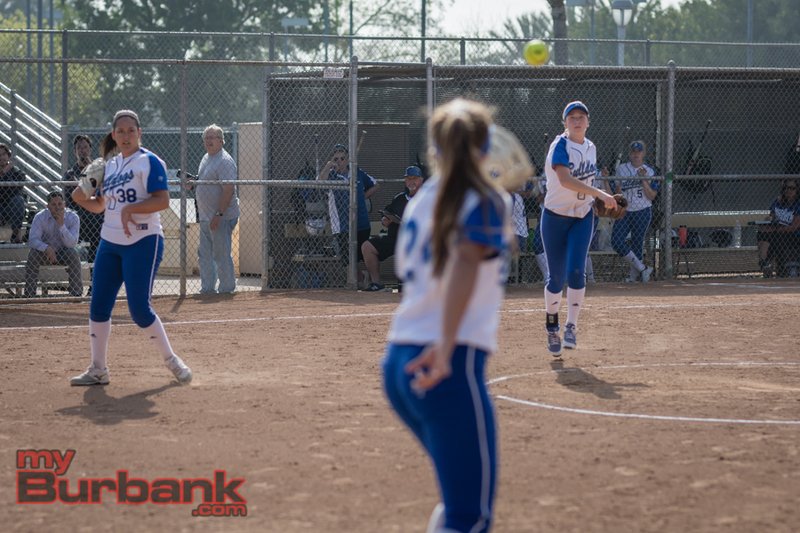 If you’re a softball coach like Burbank High’s Mike Delaney and Burroughs’ Wes Tanigawa, it’s smart to set reachable goals because it gives the players something to strive for. The Bulldogs, who went 12-14 overall and 8-6 in the Pacific League, didn’t reach the CIF Southern Section playoffs in 2017. For the Indians, who finished 19-9 and 12-2 in league, they did, but fell 7-0 to Oaks Christian in the first round of the playoffs. 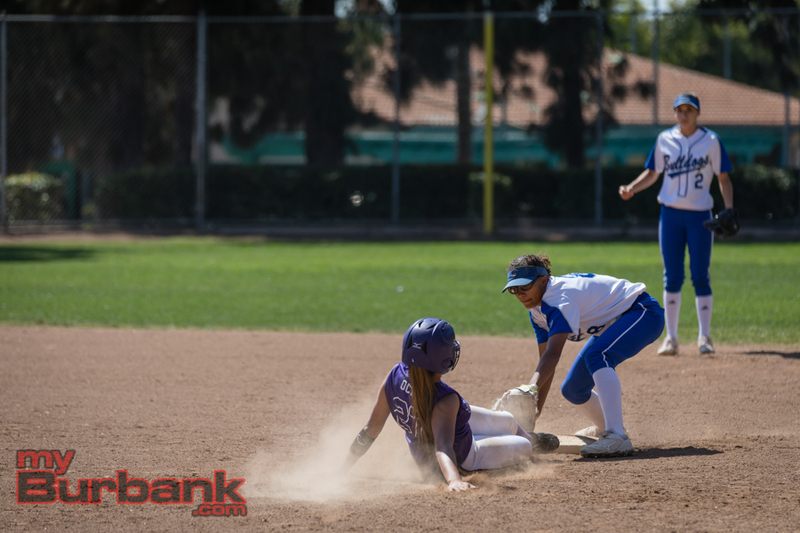 Burbank has a 3-1 record this season after participating in the Hart Tournament, and will begin the league portion of its schedule with a game at Arcadia on March 27. The Bulldogs will host the Indians on April 12 in a classic showdown and then visit the Indians on May 10. Burbank hopes to reverse its fortunes in 2018 and qualify for the postseason. There’s good reason this will be the case because the team is balanced with a fair amount of experience. One key player, senior infielder/outfielder Melissa Daniel, an honor student with designs on attending Harvard University, will not play in order to concentrate on her classes. Daniel finished with a .368 batting average, 19 runs scored along with 19 runs batted in and two home runs. The infield is set with senior Erin Lashkari, who batted .339, with 15 runs and led the Bulldogs with 21 RBIs, at first base. The tandem of senior Macie Jensen and junior Amaya Broyls will hold down second base. Jensen posted a .297 batting average, with 14 runs and 12 RBIs, while Broyls batted .354 with 21 runs tallied and 12 RBIs. Sophomore Katie Treadway will play shortstop and batted .245 along with 11 runs scored. Senior Bene Snyder finished with a .258 batting average, 10 RBIs with 10 runs and will play third base. Broyls will be behind the plate as will junior Desi Gomez, which allows Delaney flexibility. The left field spot will be manned by junior Sarah Garelick, who hit .314 with 11 RBIs and will also act as the designated hitter/designated player. Jensen and junior Carly Oldfield will also see time in left field, which once again gives Delaney plenty of options, depending on the team and the pitcher that day. Center field will be held down by junior Alex Davis, who batted .416 and paced the team with 28 runs scored. Right field will be patrolled by senior Anysia Gonzalez, who had a robust .457 batting average, which was second on the team and also scored 21 runs with 18 RBIs. In the circle will be senior Allie Benson along with junior Alyssa Porras and each hurler is capable of strong seasons. Benson started 13 games, went 6-6, had a 5.77 earned-run average, struck out 47, but issued 73 walks across 64 and one-third innings. Porras finished 6-7 in 12 games, fanned 61 with 23 walks and posted a 3.57 ERA over 84 and one-third frames. 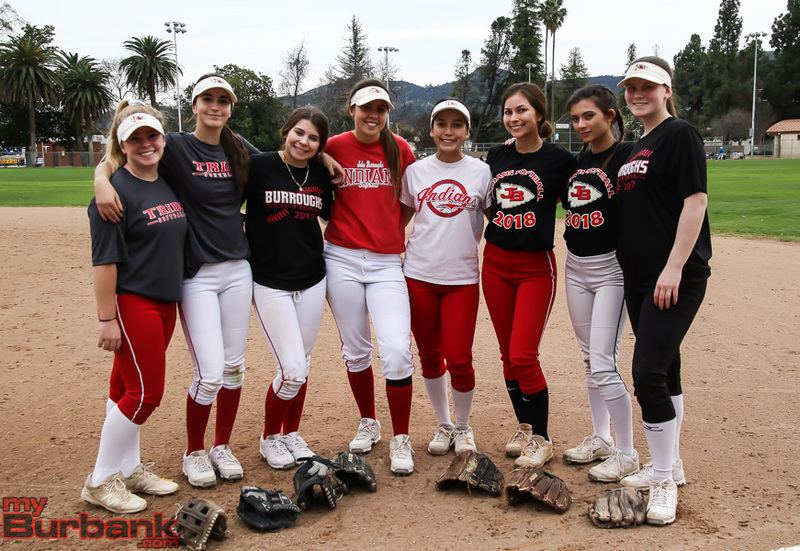 The rest of the team includes junior Izzy Sanchez, who will play right field, junior Nikki Davis, who drove in four runs and is versatile, having the skill to play first base, third base and catcher and senior Sarah Taylor, who played at Burroughs during her freshman and sophomore years, will be a pinch hitter. Burroughs, which has a 1-3-1 record this season, begins league play on March 27 when it hosts Glendale. The Indians will have two young pitchers in the circle, sophomores Sidnie Dabbadie and Isabella Kam. 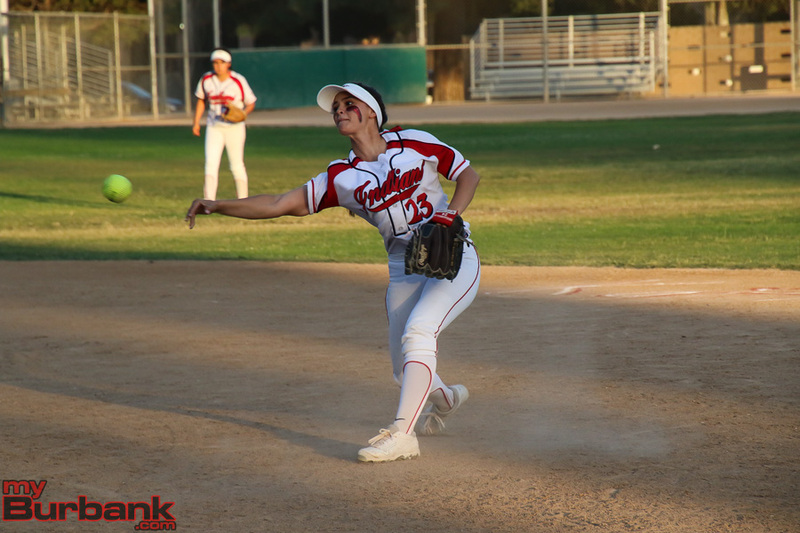 Burroughs senior ace pitcher, Presley Miraglia, will miss the 2018 campaign in order to get her grades straightened out. 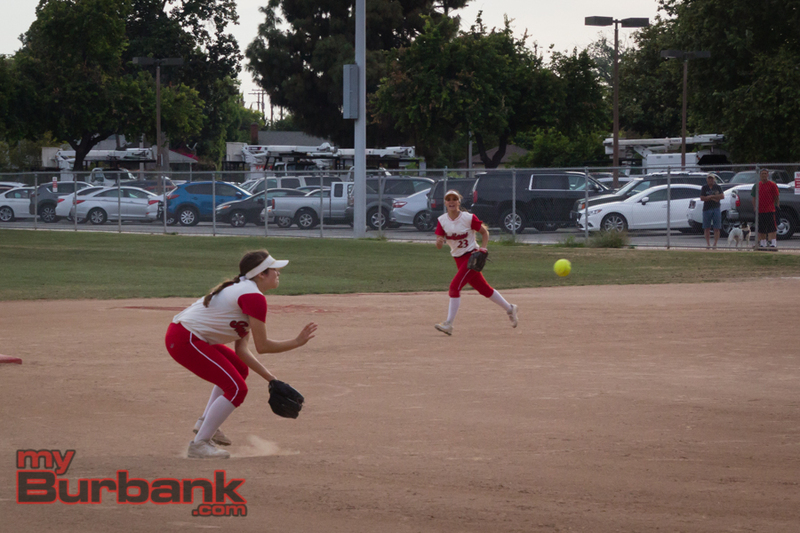 Burroughs is somewhat young when it comes to its infield, but there is still enough talent and includes senior Kaylee Vigil and sophomore Chloe Bookmyer at first base, senior Nikki Ricciardella, and junior Morgan Mersola at second base, juniors Citali Mendez and Lauryn Valencia at shortstop and sophomores Memorie Munoz and Sami Fiorella at third base. The catching duties will be handled by Fiorella with juniors Megan Williams and Sierra Harvey also helping out. 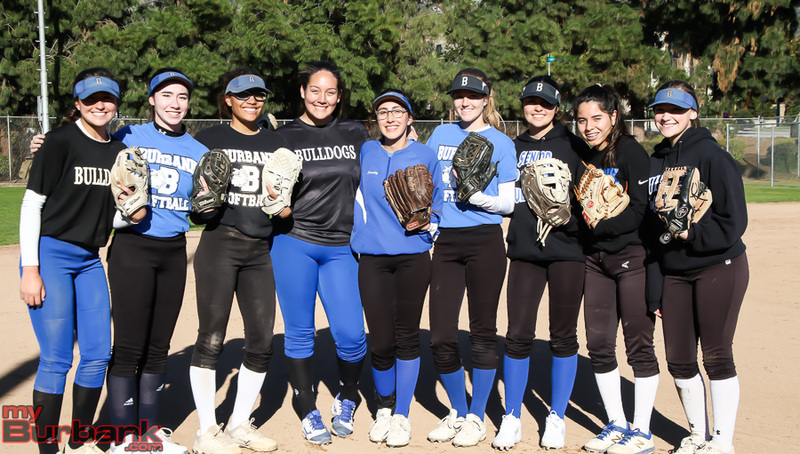 The outfield is fairly experienced and includes senior Hannah Talavera, senior Jessica Amaya, junior Mia Storer, junior Kaitlin Escamilla and junior Hannah Skinner. 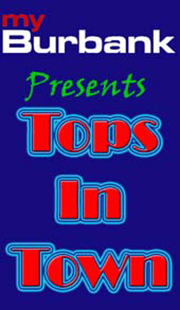 This entry was posted in Softball, Sports and tagged Alex Davis, Allie Benson, Alyssa Porras, Amaya Broyls, Anysia Gonzalez, Bene Snyder, Burbank High, Burroughs High, Carly Oldfield, Chloe Bookmyer, Citali Mendez, Desi Gomez, Erin Lashkari, girls softball preview, Hannah Talavera, Isabella Kam, Izzy Sanchez, Jessica Amaya, Kaitlin Escamilla, Katie Treadway, Kaylee Vigil, Lauryn Valencia, Macie Jensen, Megan Williams, Melissa Daniel, Memorie Munoz, Mia Storer, Morgan Mersola, Nikki Davis, Nikki Ricciardella, Pacific League, Presley Miraglia, Sami Fiorella, Sarah Garelick, Sarah Taylor, Sierra Harvey on March 24, 2018 by Rick Assad. 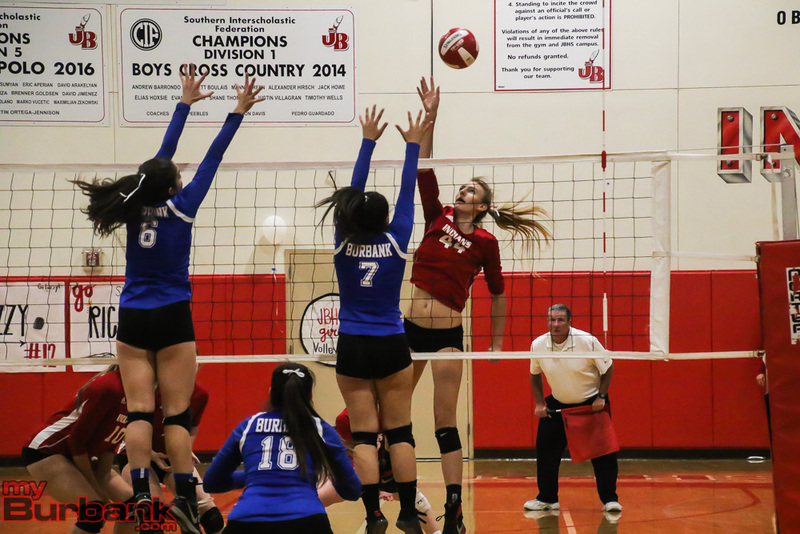 Marin Grote has been a key figure for the Burroughs girls’ volleyball team the last four years. 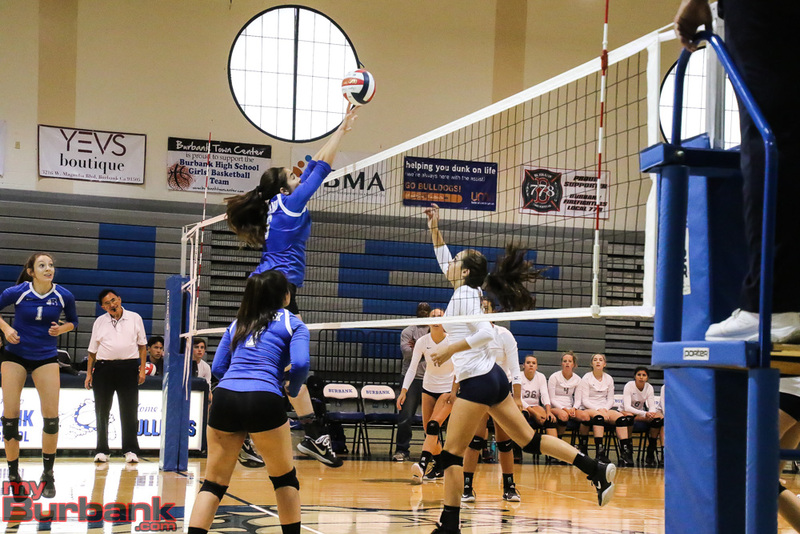 Tuesday night the 6-foot-4 outside hitter concluded the regular season of her career as the Indians defeated visiting Burbank High 25-15, 25-21, 19-25, 25-14. 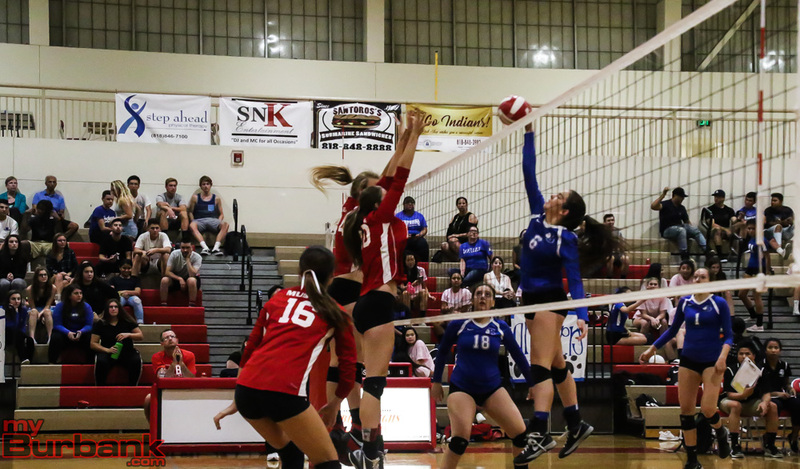 In the process, Burroughs captured the Pacific League title outright, finishing with a 13-1 in league mark. 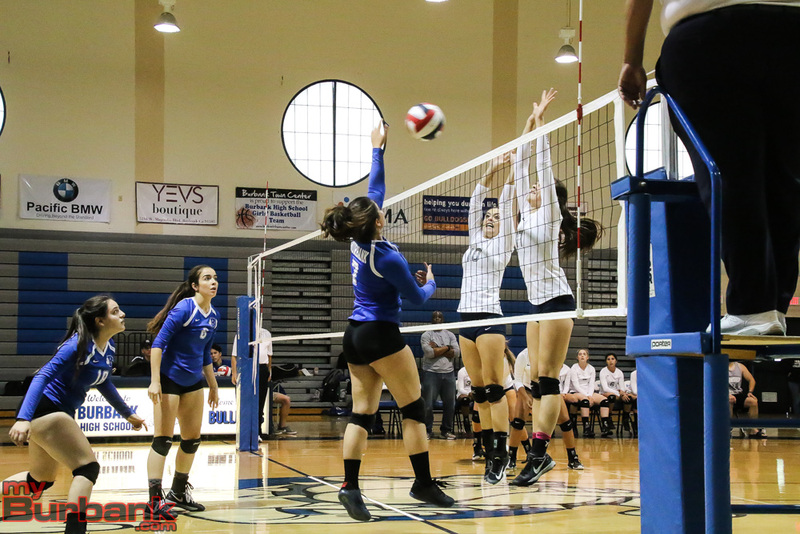 Both schools will learn of their playoff fate Thursday when the CIF Southern Section releases the volleyball pairings. Burroughs (23-5 overall) received 17 kills from Grote, 10 from junior Juliana Van Loo and six from sophomore Lydia Grote. “We played well early. We kind of put our guard down a little bit. 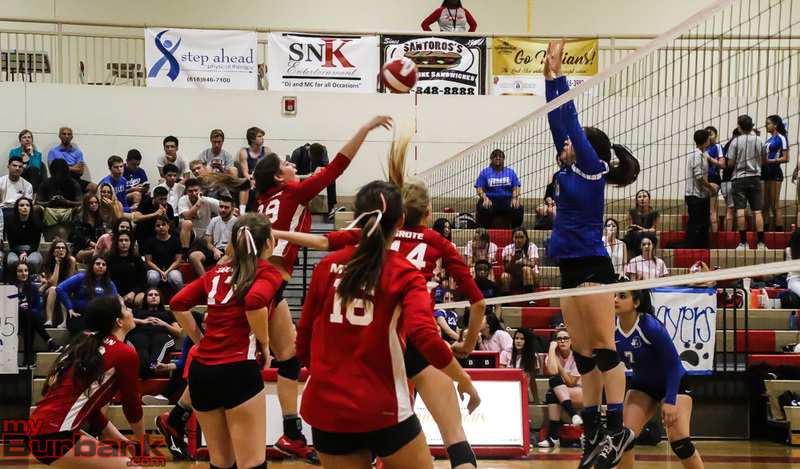 We made a lot of errors in game three,” Burroughs Coach Edwin Real said. Despite the league title and a guaranteed first round match in the CIF playoffs next week, Real said his team isn’t where he expected it would be. Burbank coach Karl Rojo praised his team for remaining tough. The Bulldogs finish the regular season 10-4 in league to finish in third place. Overall he was pleased to see the program going in the right direction. “We told our players to keep their minds on track for CIF. We did a great job this year in league finishing third. It is better than the last two years,” he said. 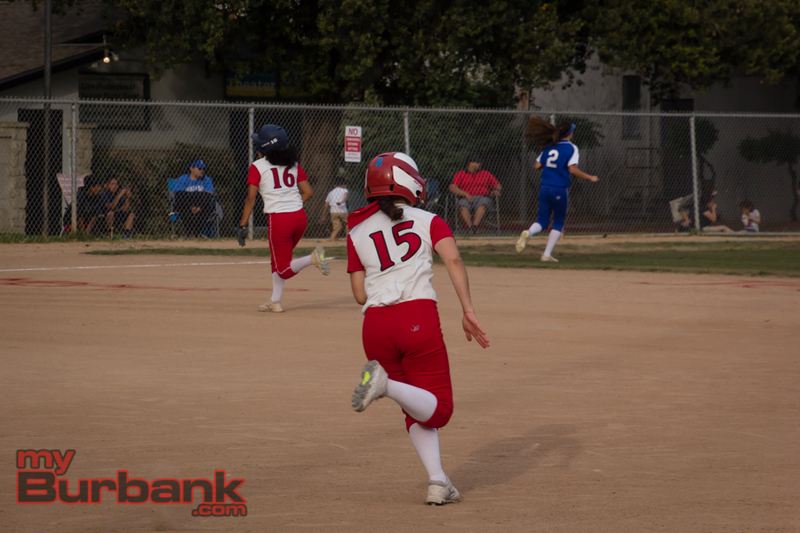 Burroughs broke away from Burbank in the first game after the two teams were tied at 9. Burbank put up a tougher fight in the second game, keeping it tied until 13. A kill by Jewel Musich clinched the second game for the Indians. 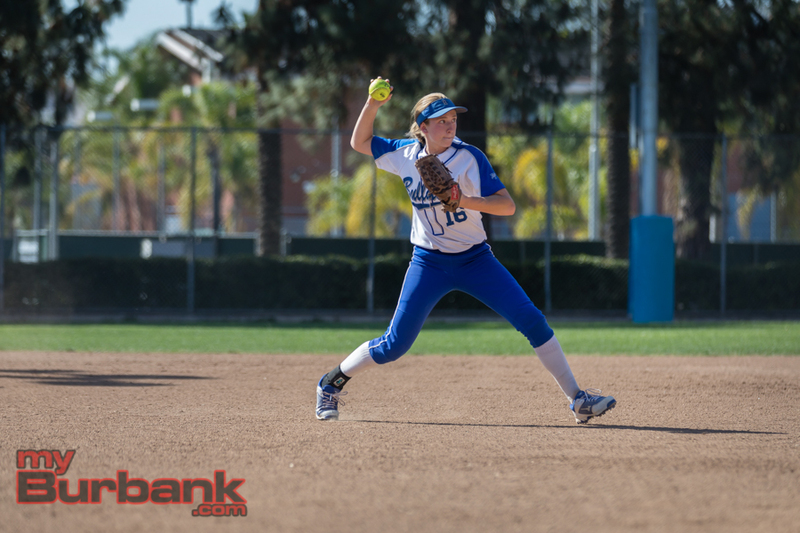 Burbank dominated the third game after Burroughs closed the gap to 9-8. A pair of aces from Erin Lashkari and a pair of kills from Melissa Daniel helped Burbank during the run that saw the Bulldogs go on a 7-0 run. A kill by Daniel forced a fourth game. Burroughs took the early lead in the fourth and didn’t have too much trouble. 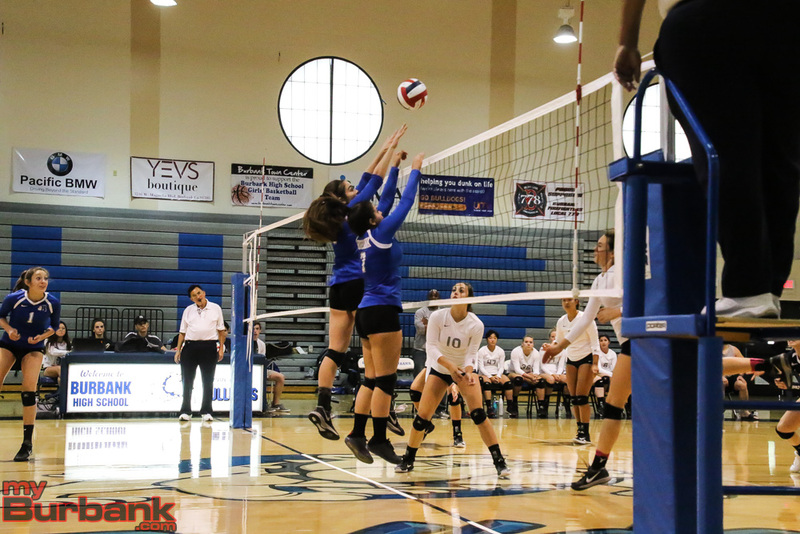 A pair of back-to-back kills from Burbank’s Suzy Torosyan gave Burbank some brief momentum. Burroughs finished things off with a kill from Ricki Patenaude. 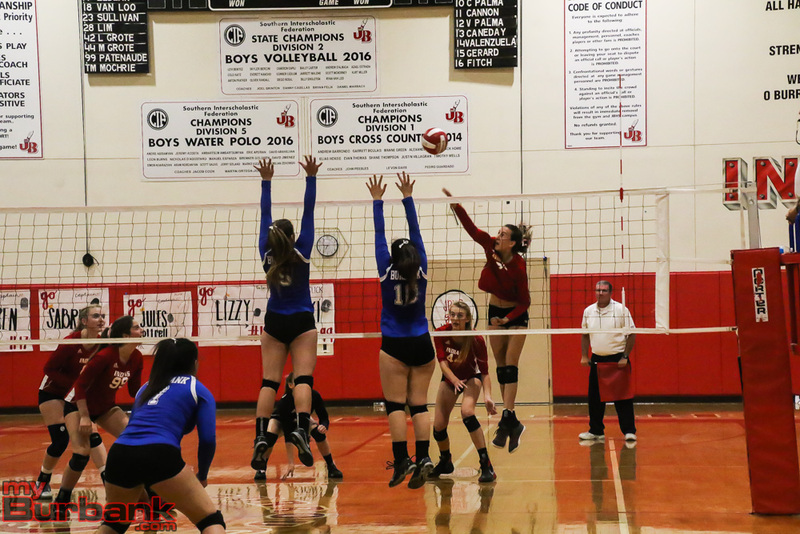 This entry was posted in Girls Volleyball, Sports and tagged Burbank Girls Volleyball, Burbank Volleyball, Burroughs girls volleyball, Burroughs volleyball, Erin Lashkari, Jewel Musich, Juliana Van Loo, Lydia Grote, Marin Grote, Melissa Daniel, Ricki Patenaude, Suzy Torosyan on October 25, 2017 by Jim Riggio. 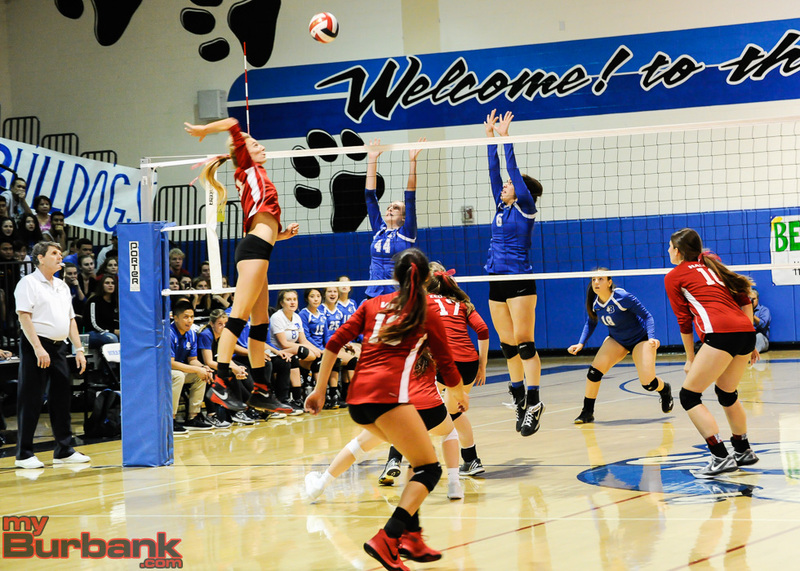 City bragging rights, Burbank High hoping to keep sole possession of first place in the Pacific League and Burroughs wanting to make it a three-way tie for the top spot along with Arcadia were all on the line Thursday night when these longtime rivals met in a girls’ volleyball match. 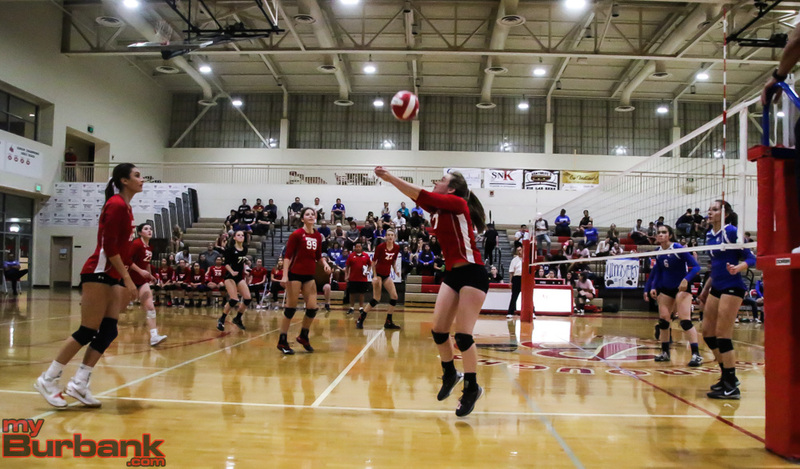 The visiting Indians came out strong, something Coach Edwin Real wanted, and partially because of this early charge only three games were needed, 25-11, 25-12, 25-23, in order to deal the Bulldogs a defeat. Senior outside hitter Marin Grote finished with a match-high 15 kills and junior outside hitter Juliana Van Loo added six. 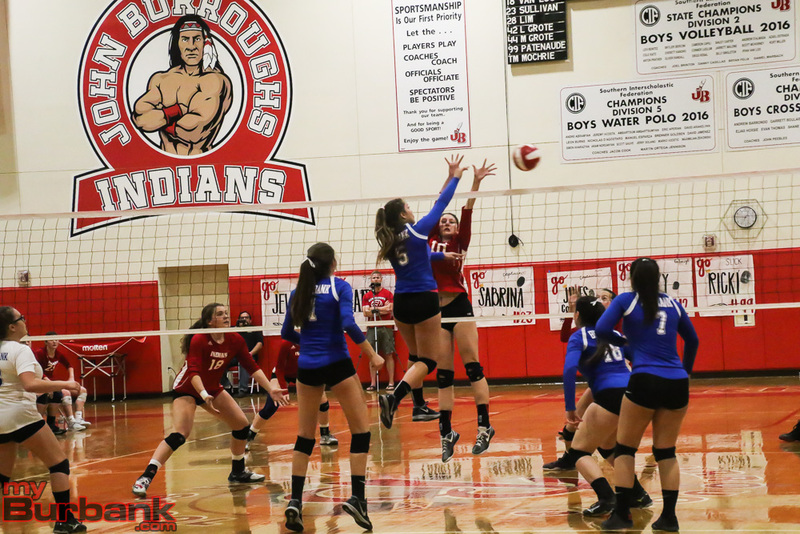 Burbank and Burroughs will meet once again on Oct. 24 at the Indians’ gym with a 6 p.m. start. 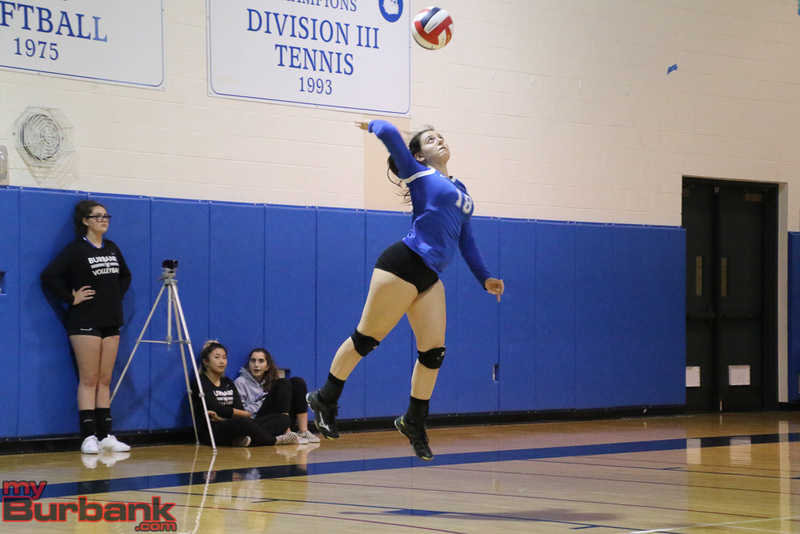 Burbank trailed throughout the third game, but came within 20-19 when senior middle blocker Ricki Patenaude’s shot found the net. 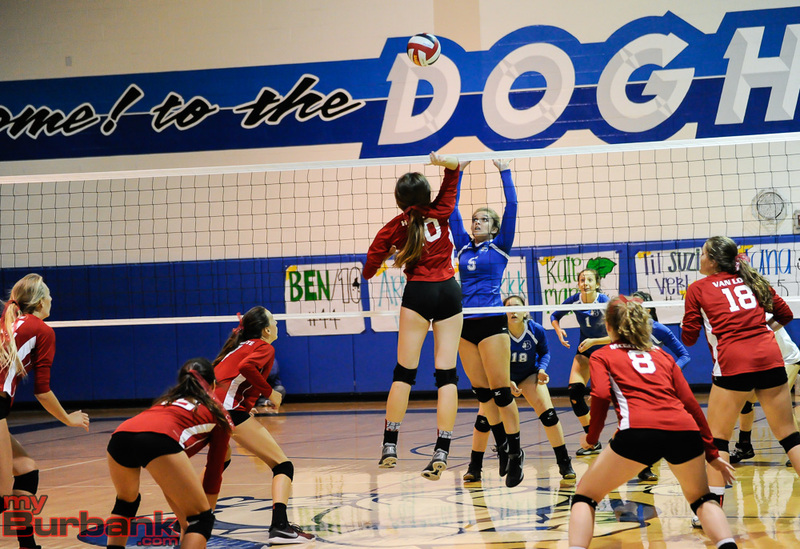 Another point for the Bulldogs would have evened it, but Van Loo’s kill made it 21-19. 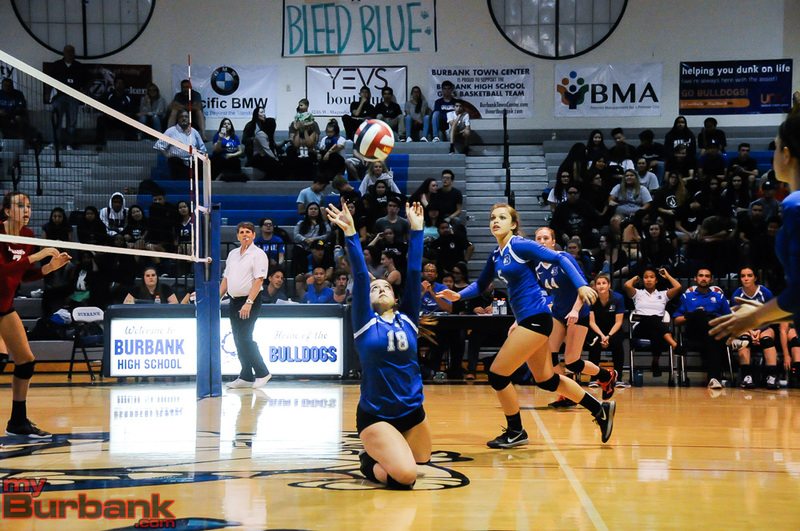 Burbank didn’t give up as it drew within 22-20 on a kill from senior outside hitter Melissa Daniel. 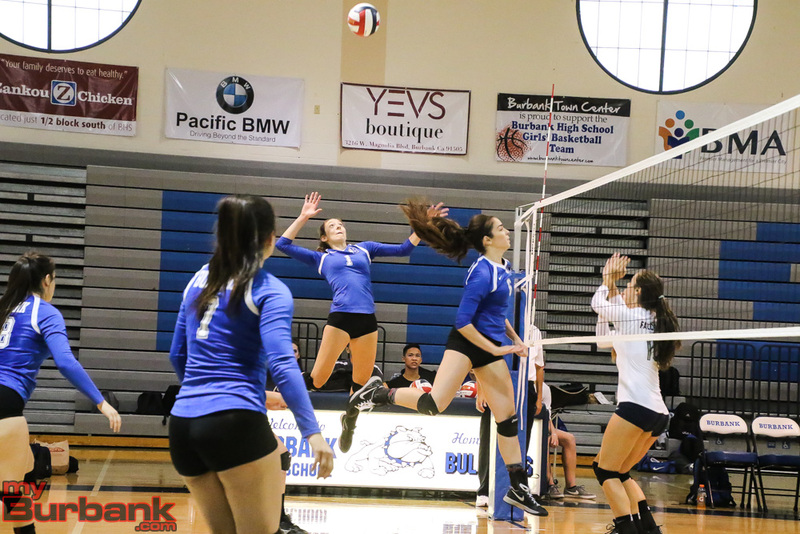 When senior opposite hitter Erin Lashkari served up an ace, the Bulldogs (12-2 and 6-1 in league) climbed within 22-21 and leveled it at 22-22 on a sizzler from Daniel. When senior opposite hitter Suzy Torosyan added a spike, Burbank pulled into the lead, 23-22, as the Indians asked for time out. But Grote’s bullet evened it at 23-23 and senior libero Sabrina Sullivan’s service ace made it 24-23. The match clincher came when Burbank used four touches in order to get the ball across the net according to the referee, with Grote standing in front and ready to pounce. The Indians (14-2 and 6-1 in league) dashed ahead 3-1 in the third stanza on Grote’s spike and Grote’s smash made it 6-4 and her ace made it 7-4. Van Loo’s tapper put Burroughs, which has now defeated Burbank five consecutive matches, in front 9-6, but Daniel’s spike saw the Bulldogs get within 10-8. 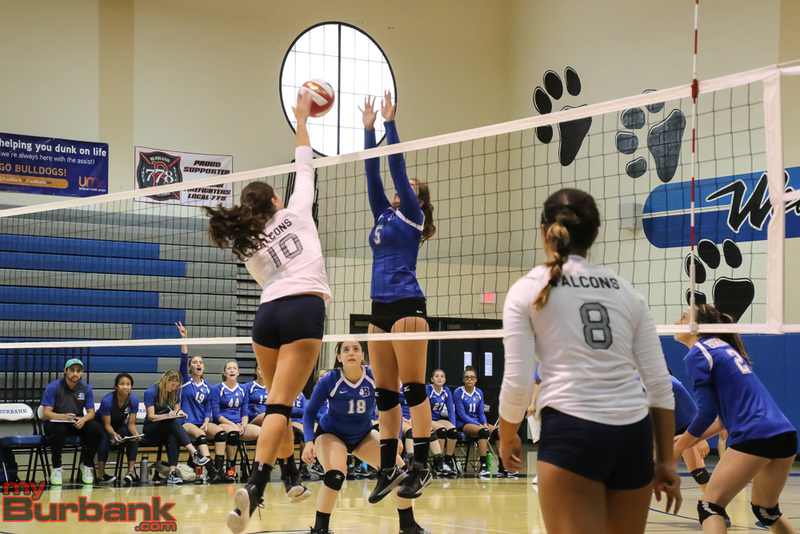 When Grote added a kill, the Indians took over at 13-10 and Grote’s spike made it 14-11. 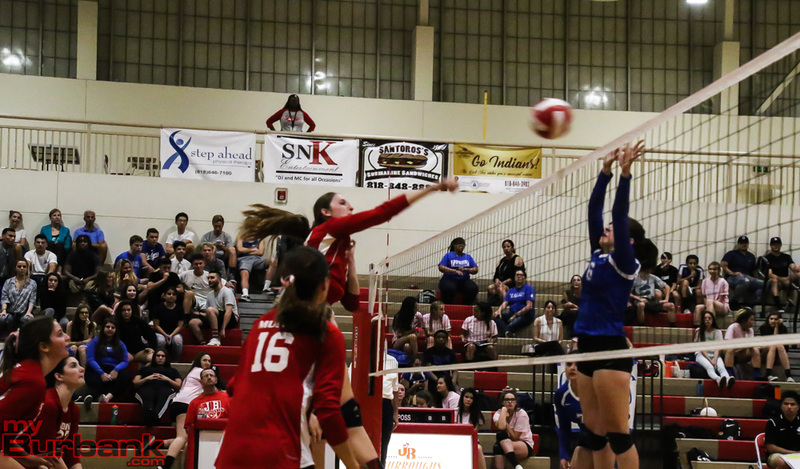 Burroughs opened the initial stanza by claiming 11 of the first 14 points that included a tapper from junior middle blocker Maggie Harris which prompted Burbank Coach Karl Rojo to ask for time. The Indians seized control 15-6 on a kill from Patenaude and 16-7 on Grote’s bomb. When junior opposite hitter Shea McGovern (four aces) unloaded three straight aces the lead swelled to 20-8 and it became 21-8 and 23-8 on a pair of Grote kills. It was more of the same in the second game as the Indians captured the first five points before Daniel’s kill broke the spell to make it 5-1. 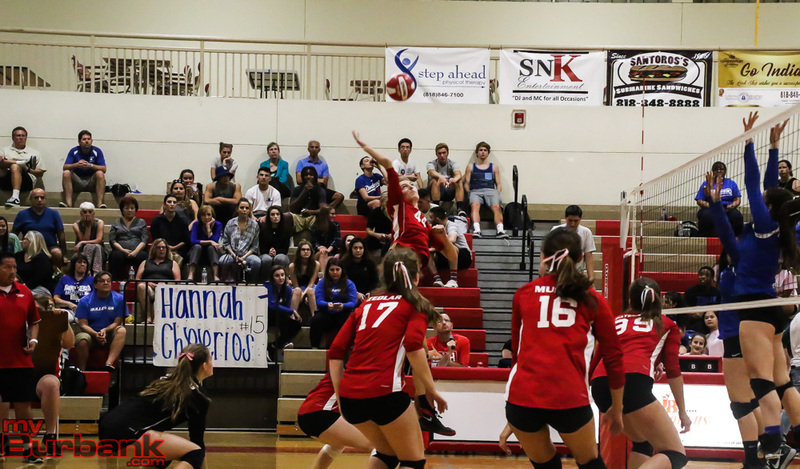 Burroughs took over 12-5 and 15-7 on kills from sophomore outside hitter Lydia Grote. 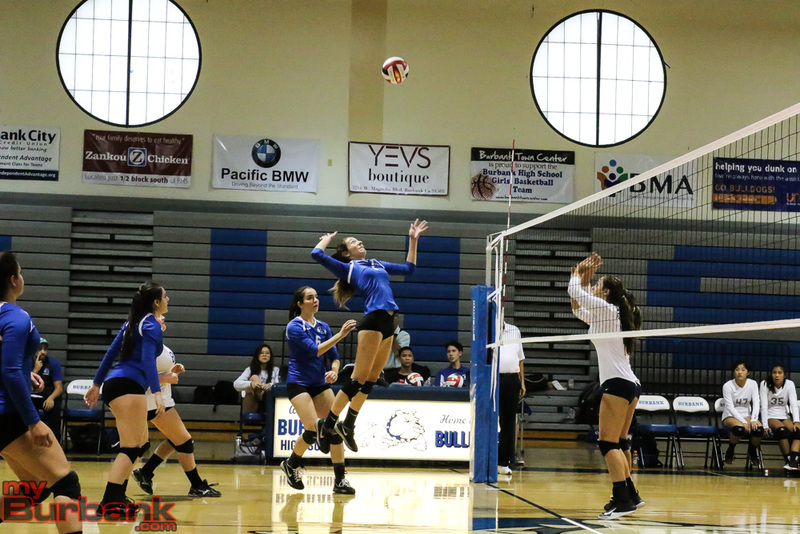 The Bulldogs rallied and shaved the lead to 17-10 on Lashkari’s kill, however, Marin Grote had back-to-back bullets that made it 20-10 as Burbank needed a respite. Marin Grote’s tapper put the Indians ahead 21-11 and Van Loo’s spike forged a 22-12 advantage. Senior libero Lizzy Jessen’s service ace gave Burroughs a 23-12 lead and the Indians then took the next two points. This entry was posted in Girls Volleyball, Sports and tagged Burbank High, Burroughs High, Erin Lashkari, Girls Volleyball, Juliana Van Loo, Lizzy Jessen, Lydia Grote, Maggie Harris, Marin Grote, Melissa Daniel, Pacific League, Ricki Patenaude, Sabrina Sullivan, Shea McGovern, Suzy Torosyan on September 29, 2017 by Rick Assad. 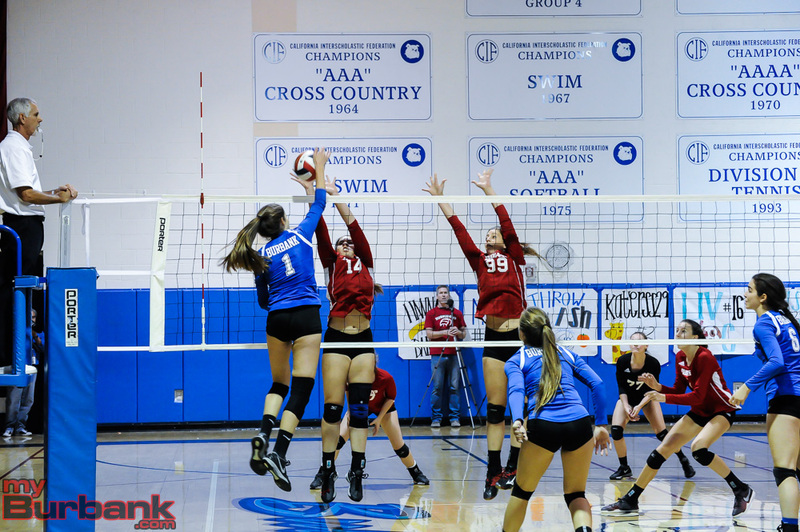 It seemed that whenever the Burbank High girls’ volleyball team needed a point or a key play, Melissa Daniel was ready to deliver. In the fifth and deciding game in Thursday’s Pacific League match, Daniel had six kills and a combined stuff as the host Bulldogs took down Crescenta Valley, 25-22, 27-25, 20-25, 22-25, 15-7. Daniel scored the first two points on kills before sophomore outside hitter Katie Treadway (six aces and three kills) tossed in an ace that made it 3-0. Daniel’s spike pushed the lead to 4-0, while senior middle blocker/opposite hitter Erin Lashkari’s stuff extended it to 5-0. Lashkari and Daniel then teamed up on a jam as the advantage swelled to 6-0. 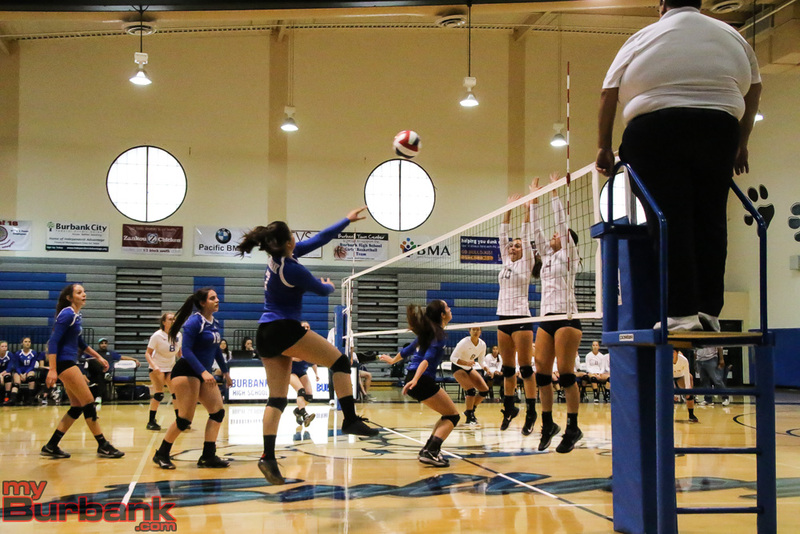 The Falcons (1-7 and 0-3 in league) scored a point on a net violation, but Daniel added a kill and senior opposite/outside hitter Arpi Garibyan (three kills) tossed in a stuff that made it 8-1 as Crescenta Valley asked for time. Daniel’s spike made it 10-1 and her smash supplied the Bulldogs with a 12-6 lead. Crescenta Valley’s Teny Noordermeer rises up, but is met by Erin Lashkari in a Pacific League match. (Photo by Ross A. Benson). 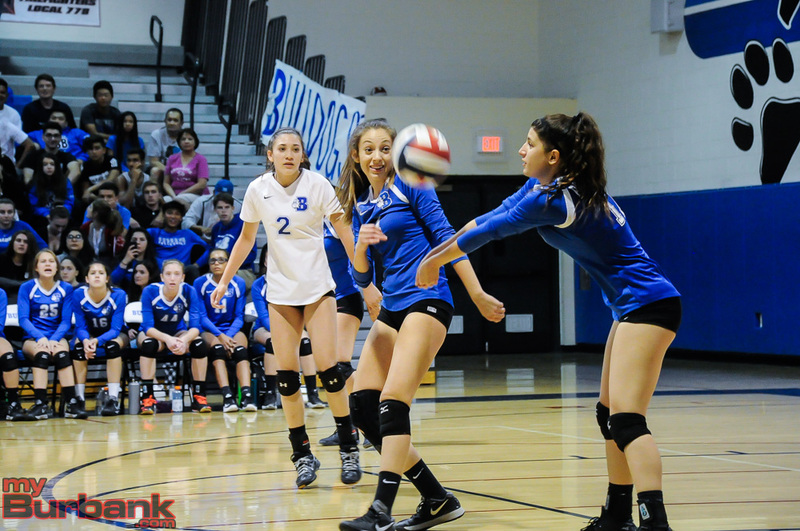 Eventually Burbank (4-0 and 3-0 in league) would take the match after winning three of the next four points including Treadway’s dagger that made it 14-7 and senior defensive specialist/libero Katie Marcy’s service ace for the clincher. When asked if it was intentional that she had the ball set in the fifth set, Daniel said that it wasn’t. The opening game was tied 1-1, 2-2, 3-3, 5-5, 6-6, 9-9, 10-10 and 11-11, but the Bulldogs took over 16-14 on an ace from senior opposite hitter Suzy Torosyan (six kills and 13 digs) and 20-16 on Treadway’s bullet. When Lashkari had a tap-stuff, Burbank led 21-19, but the Falcons tied it at 21-21 on an ace from senior outside/opposite hitter Marley Gang. A kill from Daniel gave the Bulldogs a 22-21 edge, and the Bulldogs would take three of the next four points for the set. Burbank led 4-1 in the second game on Garibyan’s stuff and 12-5 on Torosyan’s winner. A kill from Daniel gave the Bulldogs a 16-10 edge and it would be even at 20-20 on a stuff from Treadway. Crescenta Valley tied it at 24-24 on junior opposite hitter/middle blocker Grace Holland’s kill, only to see Lashkari’s spike make it 25-24 and Daniel’s kill push it to 26-25. 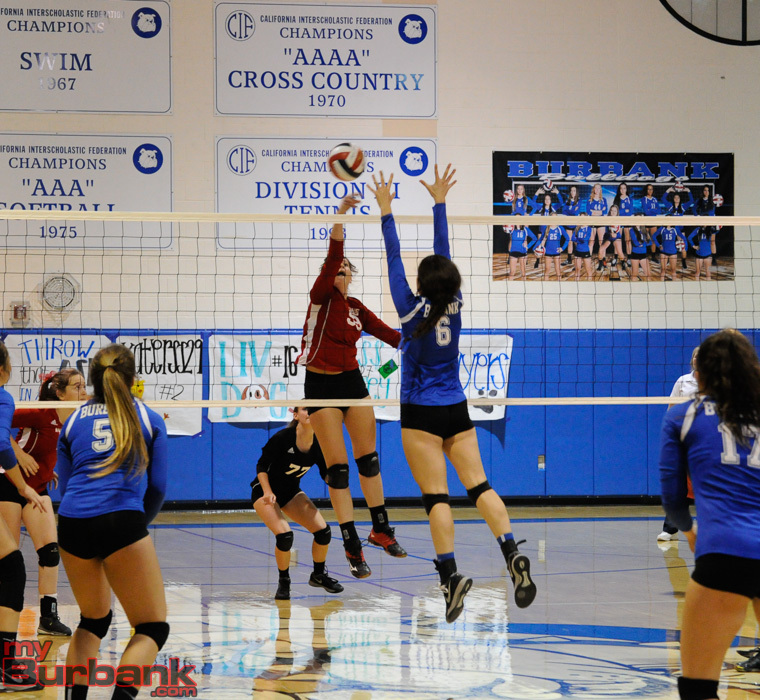 Burbank moved in front 3-0 in the third set on Treadway’s ace, and it would be tied 14-14 on Treadway’s tapper. The Bulldogs darted in front 17-14 on Marcy’s ace as Crescenta Valley asked for time and then outscored Burbank 11-3 for the set. It was tied eight times in the early going in the fourth set before the Bulldogs led 12-10 on an ace from sophomore setter Ashley Eskander (25 assists). The Falcons forged a 20-16 advantage on Gang’s blast as the Bulldogs needed a time out. Burbank came within 23-20 on Treadway’s service ace as the Falcons asked for time, but when Lashkari’s serve sailed out of bounds, the fifth set became necessary. 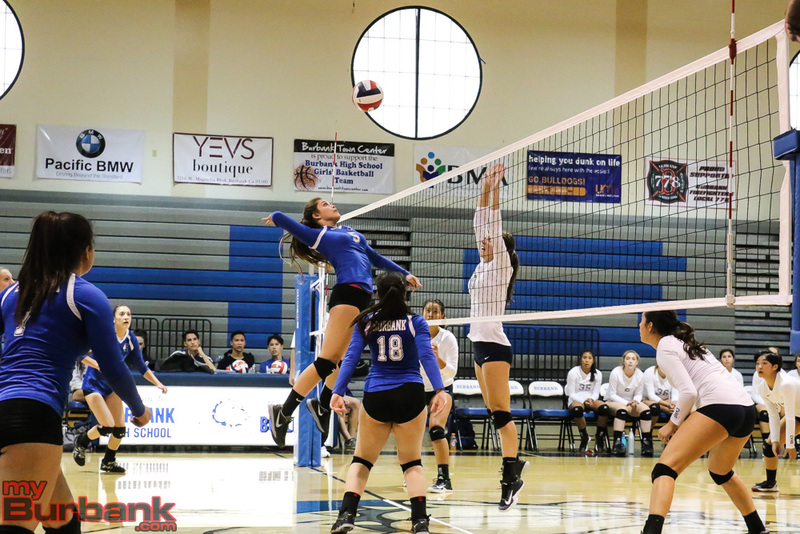 This entry was posted in Girls Volleyball, Sports and tagged Arpi Garibyan, Ashley Eskander, Burbank High, Erin Lashkari, Girls Volleyball, Katie Marcy, Katie Treadway, Melissa Daniel, Pacific League, Suzy Torosyan on September 15, 2017 by Rick Assad.